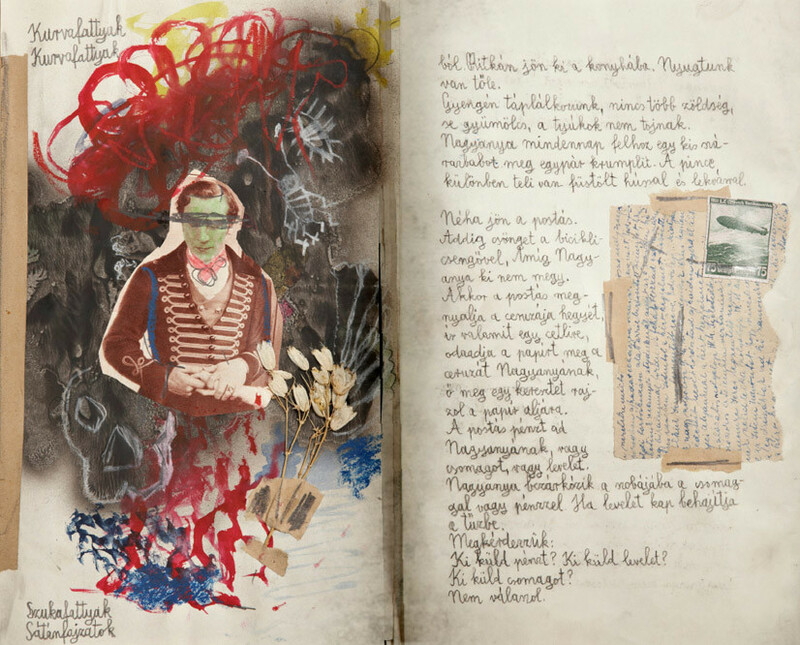 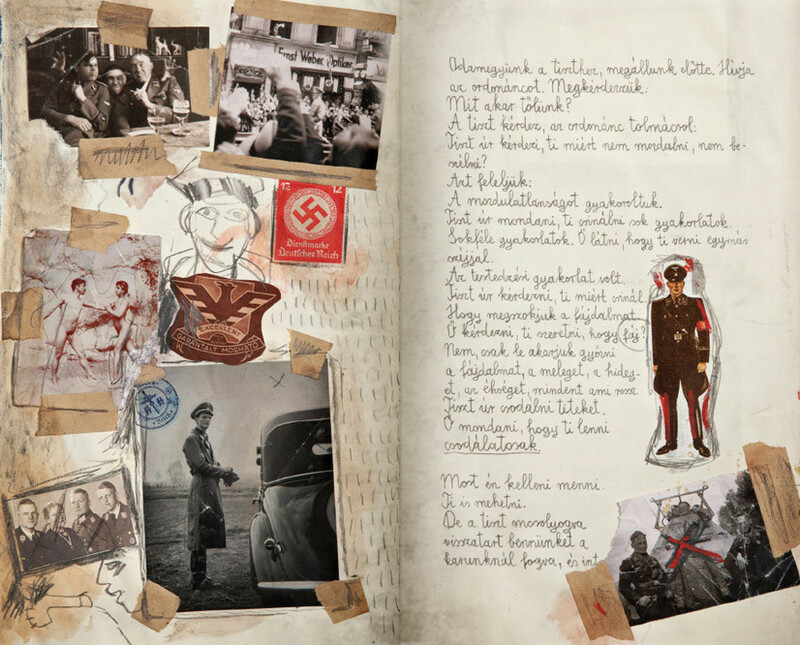 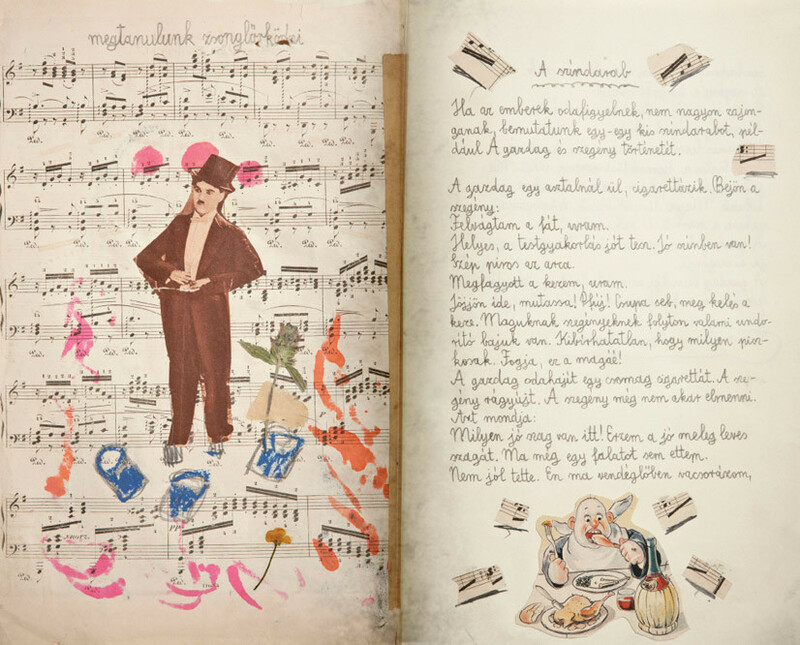 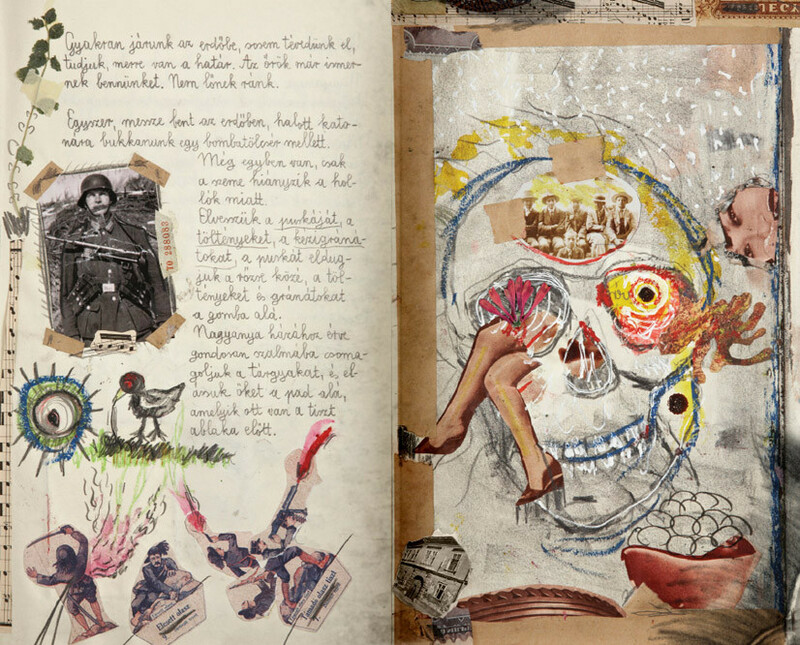 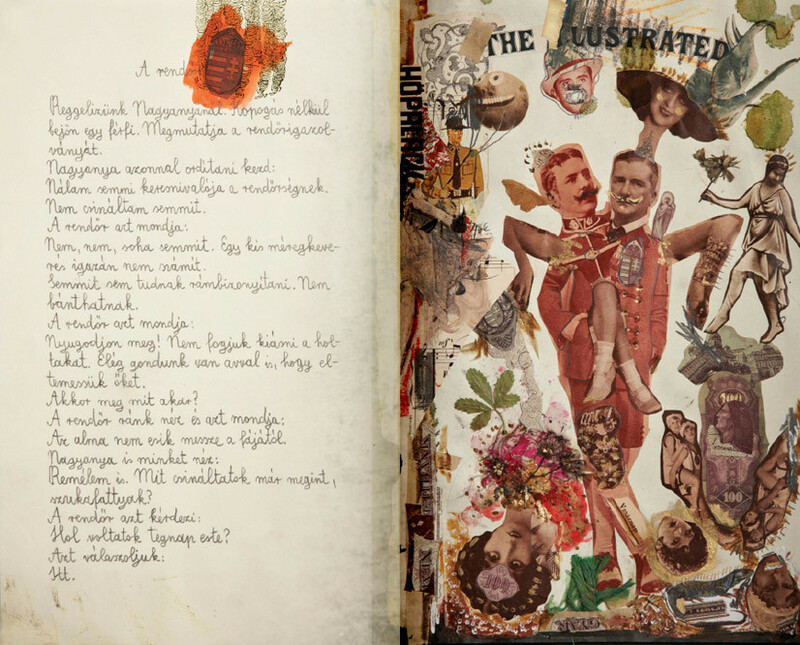 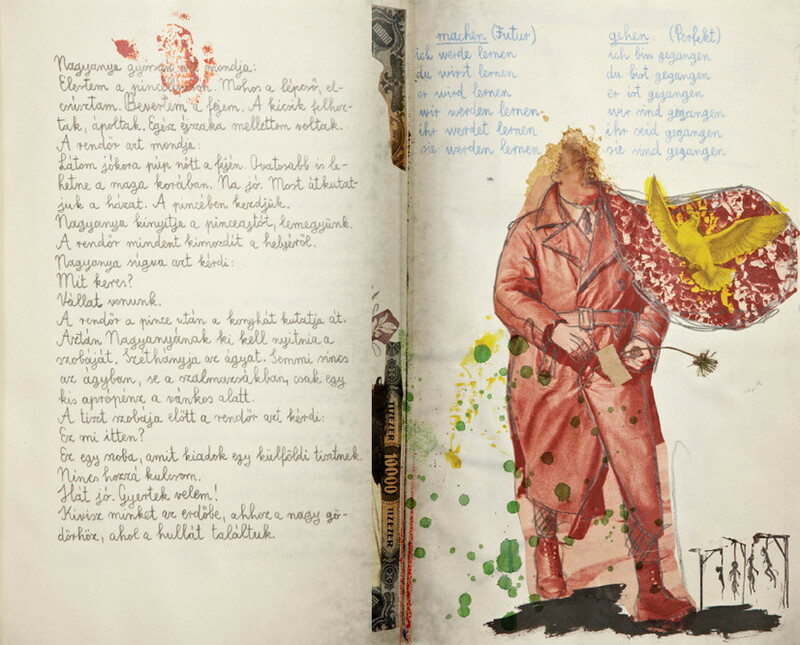 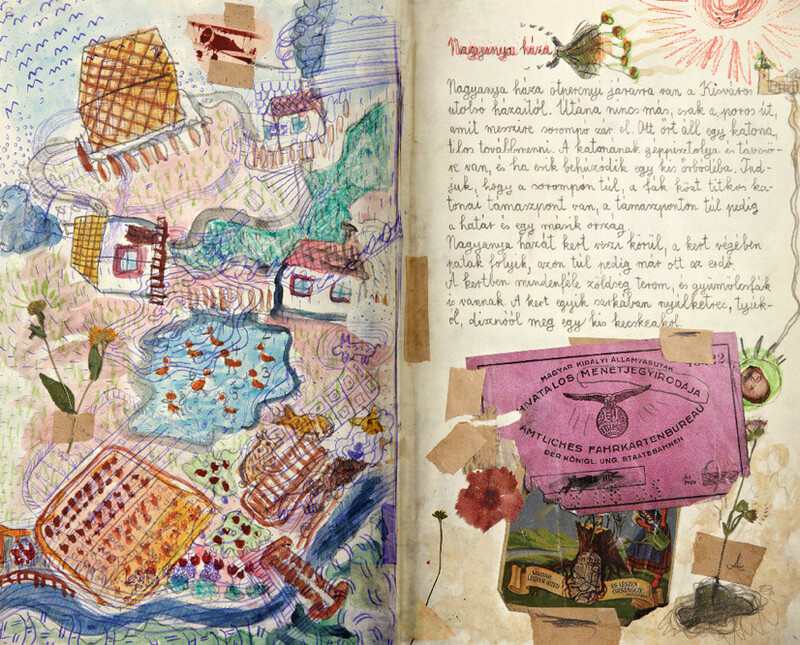 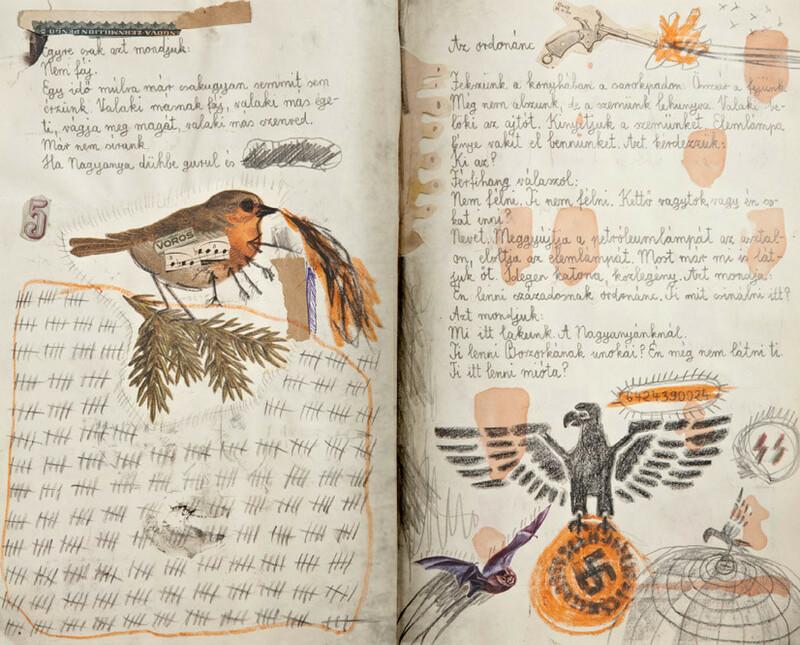 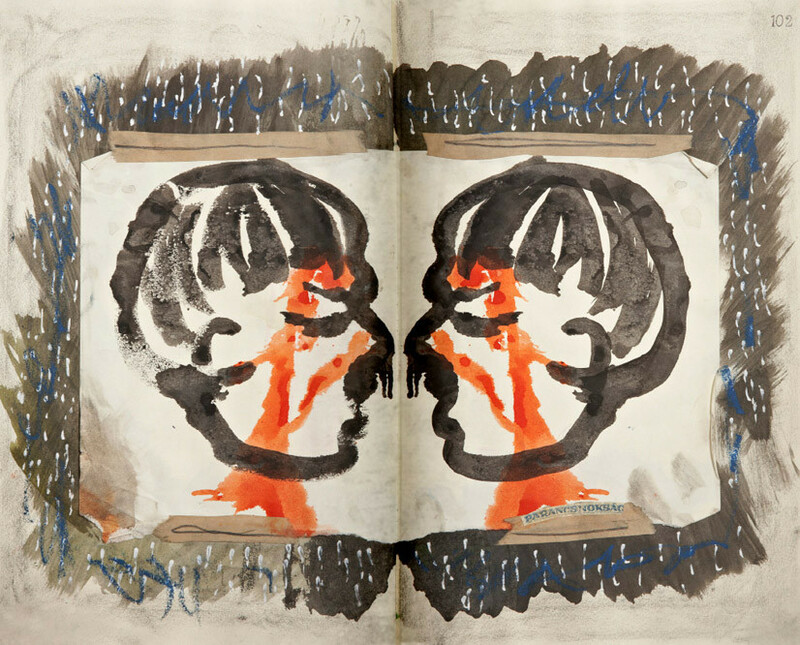 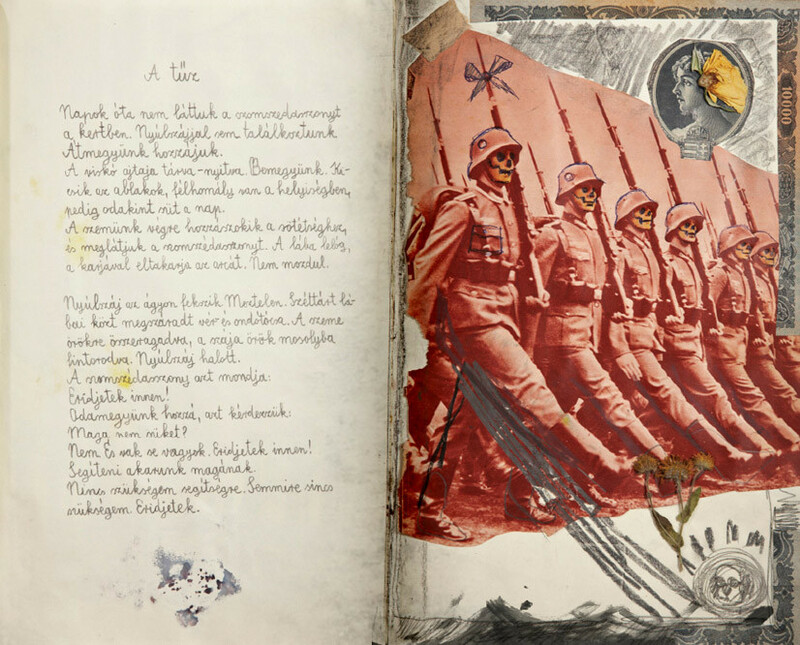 The Notebook series presented in Stockholm are based on Agota Kristof´s book The Notebook that tells the story of the twin brothers Claus and Lucas locked in an agonising bond that becomes a gripping allegory of the forces that have divided "brothers" in much of Europe since World War II. 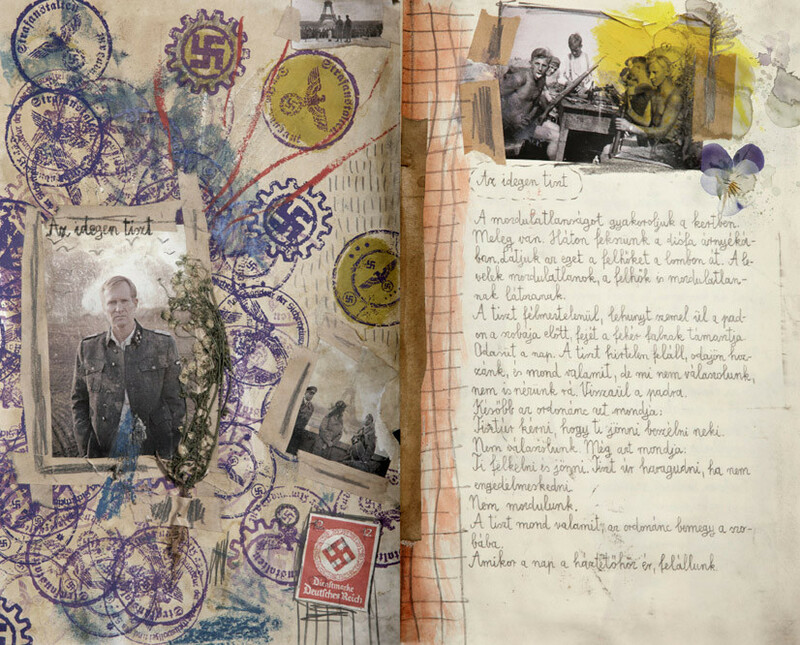 Kristof's postmodern saga begins with The Notebook in which the brothers are children lost in a country torn apart by conflict and who must learn every trick of evil and cruelty merely to survive. 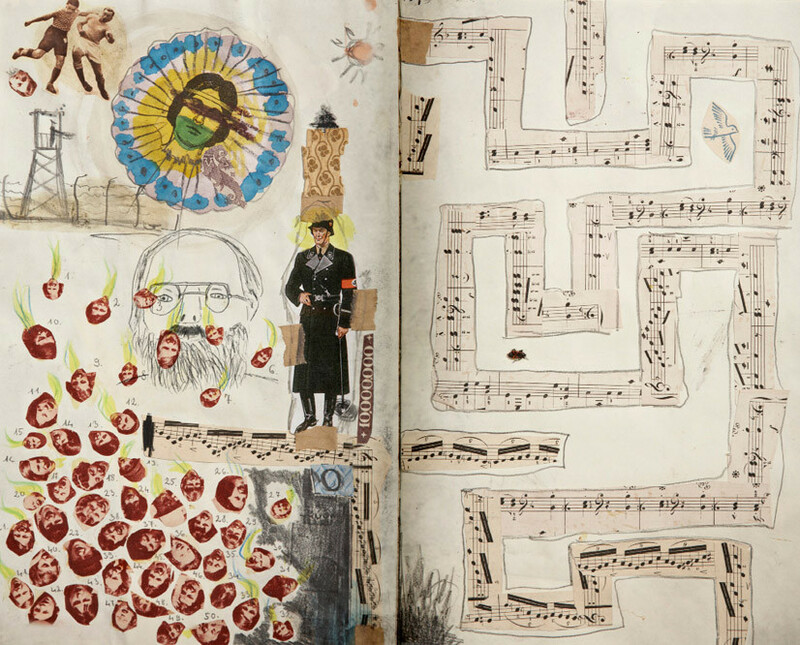 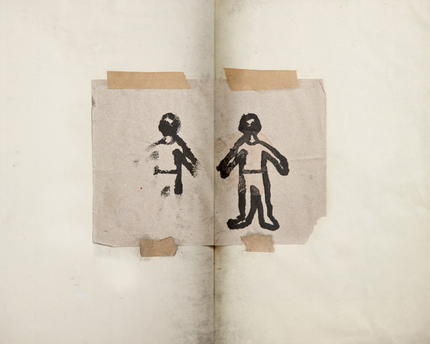 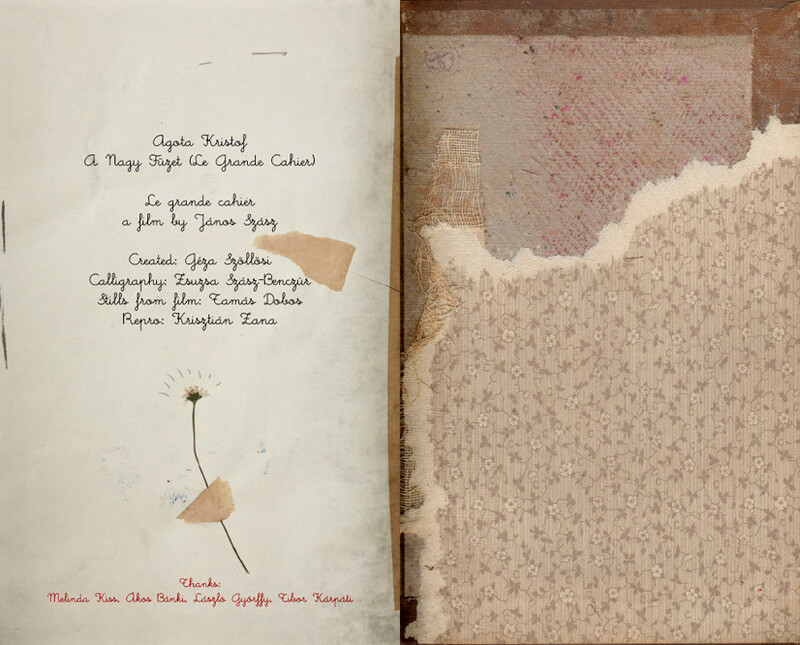 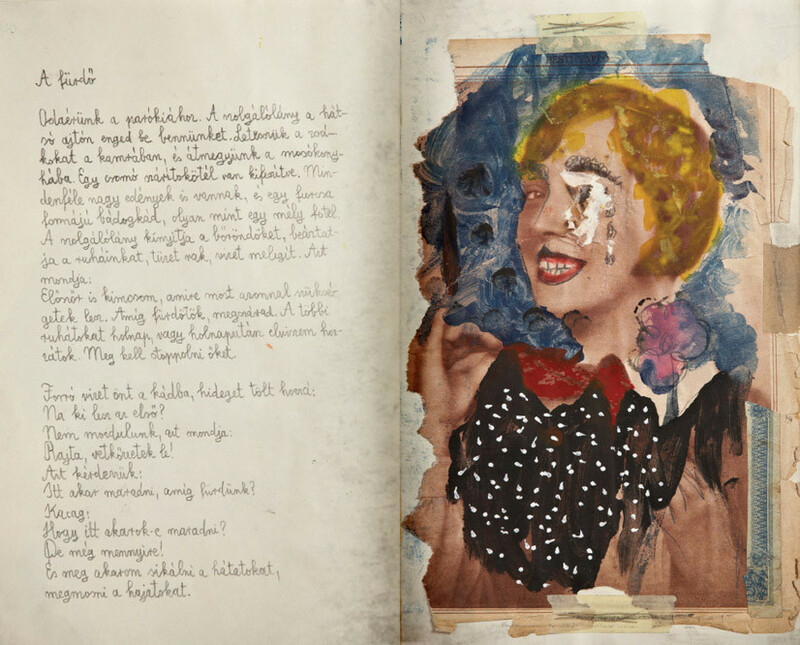 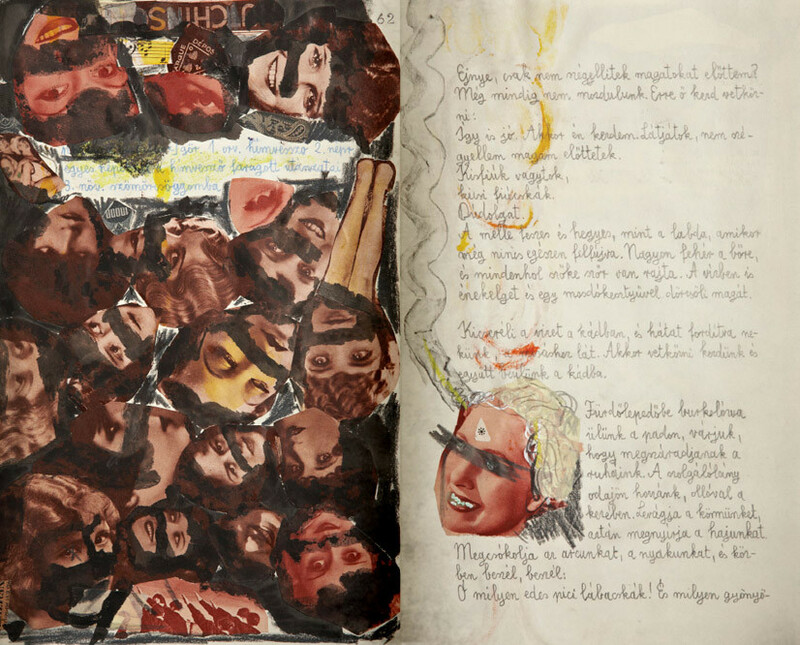 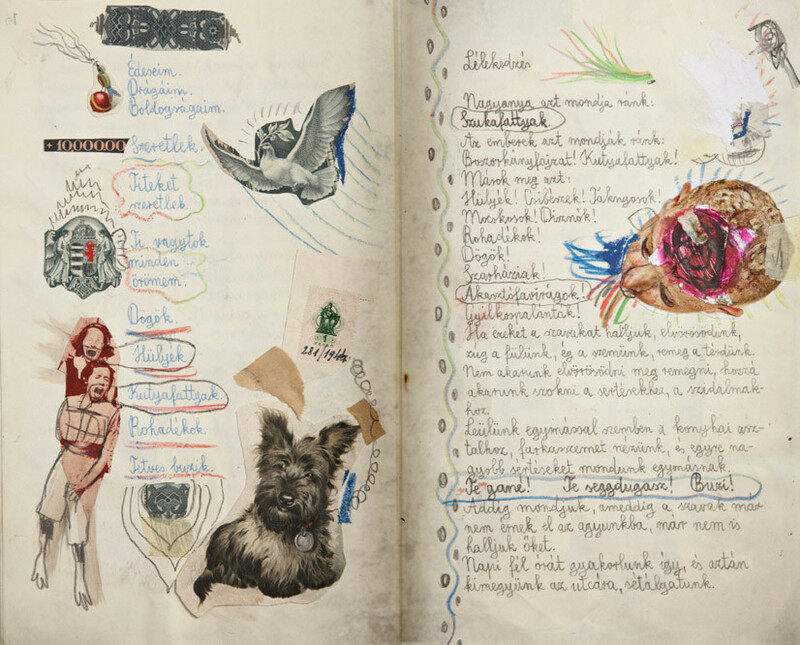 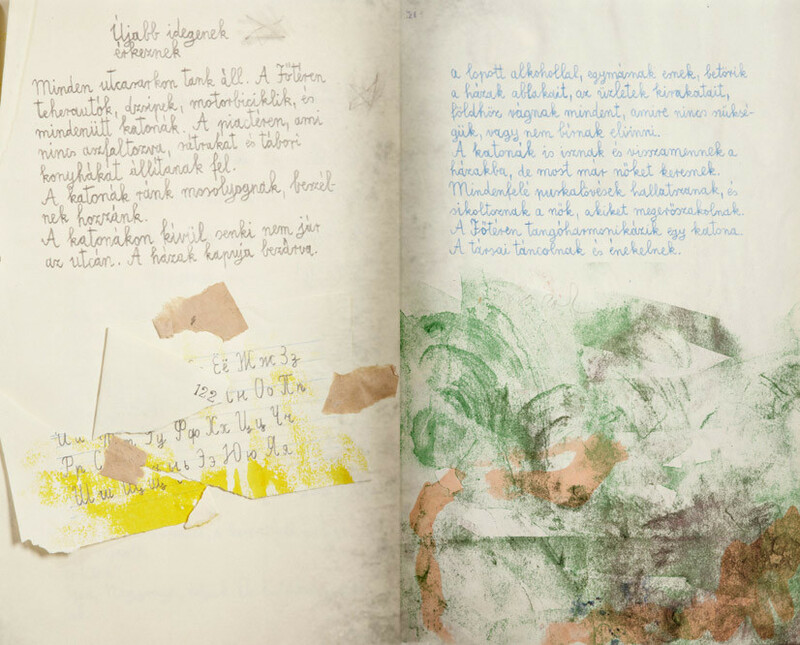 Geza Szölösi´s The Notebook is a pictures book created for a film made by János Szász where the challenging tasks are dealing with questions such as identity, existence and feelings of loss. 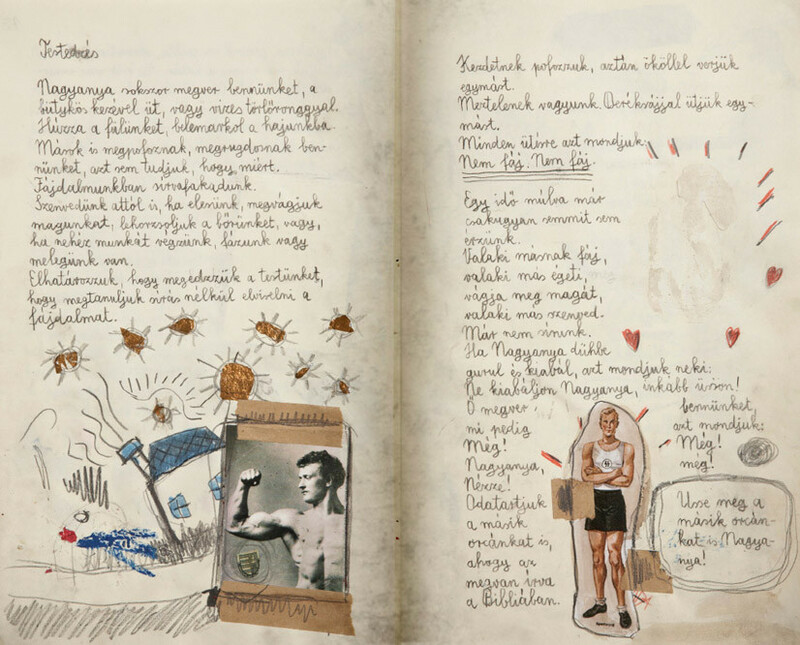 The Notebook is a biting parable of Eastern and Western Europe today and a deep exploration into the nature of identity, storytelling and the truths and untruths that lie at the heart of them all. 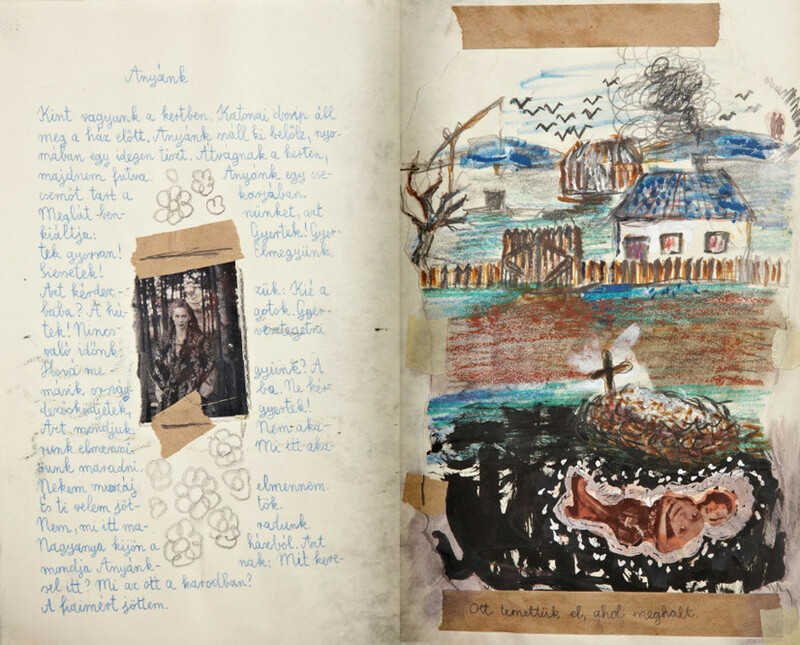 Some parts in Europe are characterized by havoc, a mother ensuring safety for her Twins by their grandmother in the countryside, where the children have to seek on their own the means which enables them to survive. 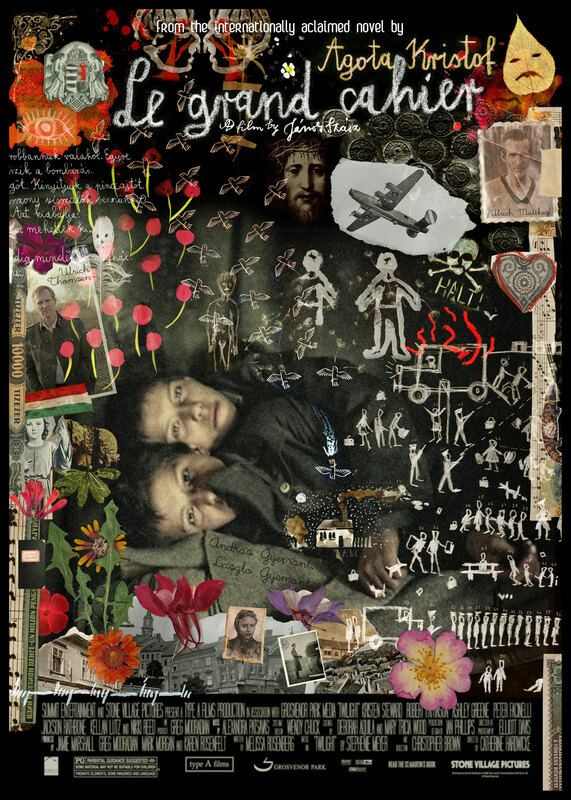 The two boys are determined that they will not become defenseless and that they will strengthen their bodies and souls against the world. Lonely, starving and freezing do they keep their diaries in the big notebook. 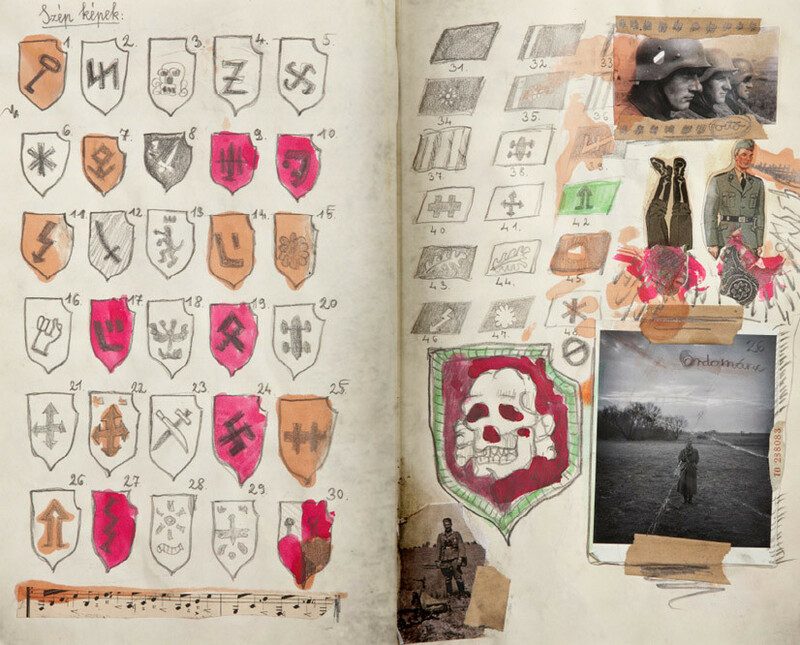 They put down everything they have seen, heard, done and learned. 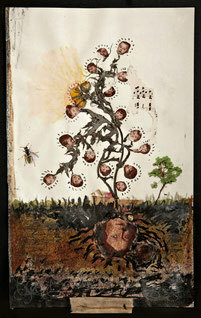 Although they stay alive, their hearts toughen, their staminas develop. 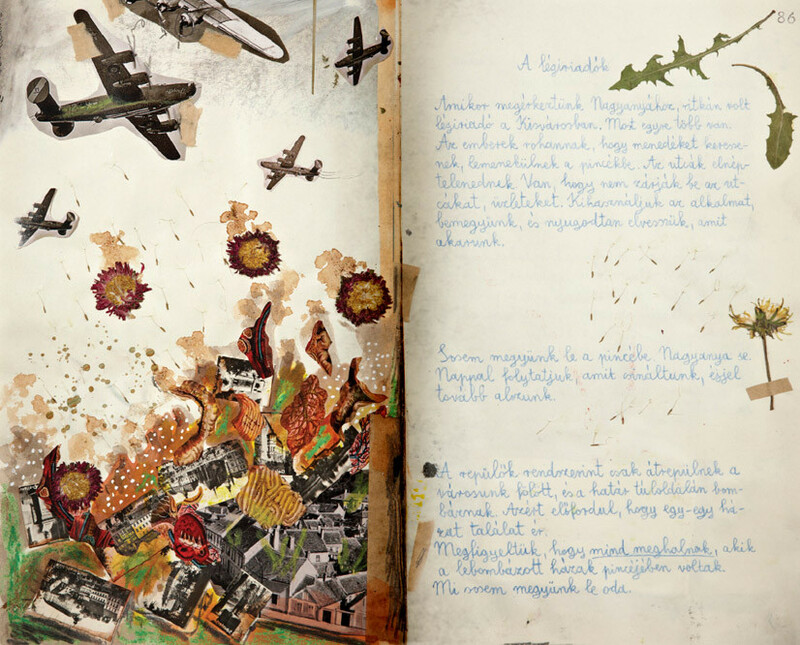 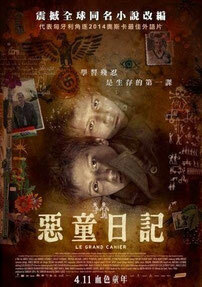 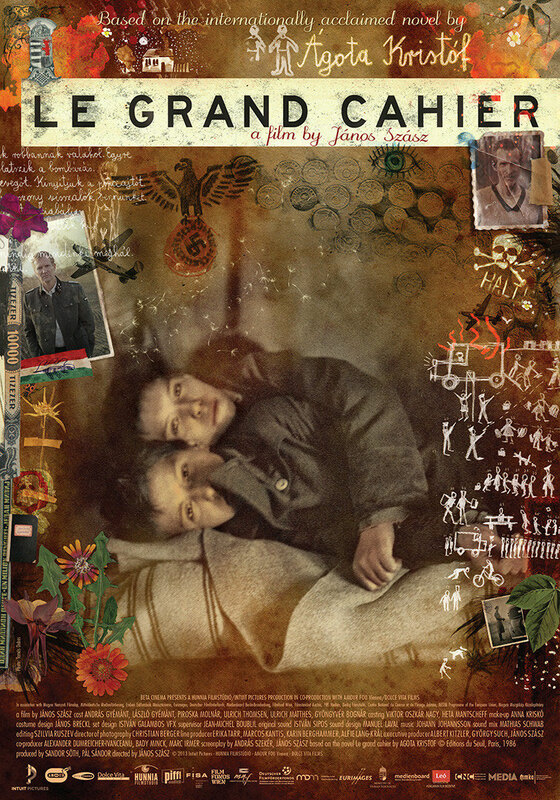 The big notebook is a postmodern anti-war drama, profound parabola about how war can affect the psyche of a child. 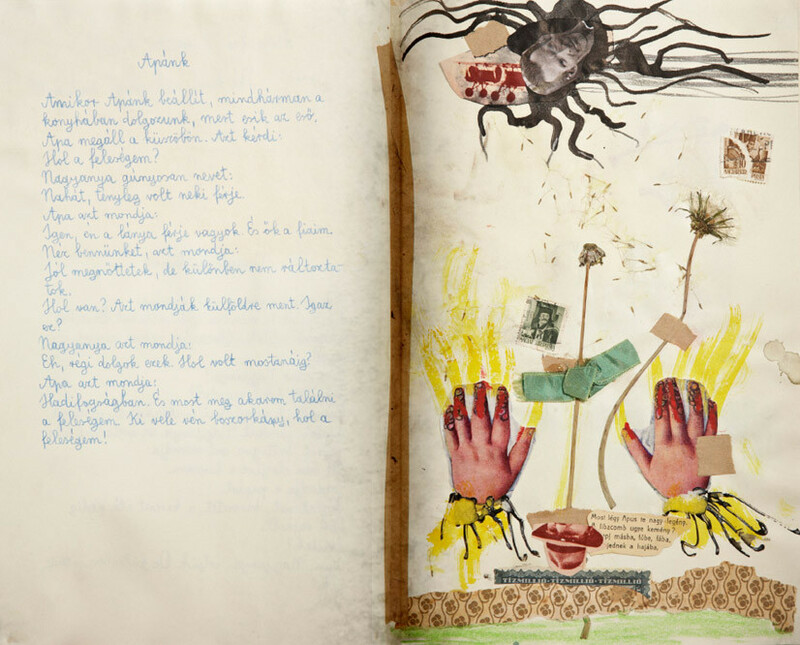 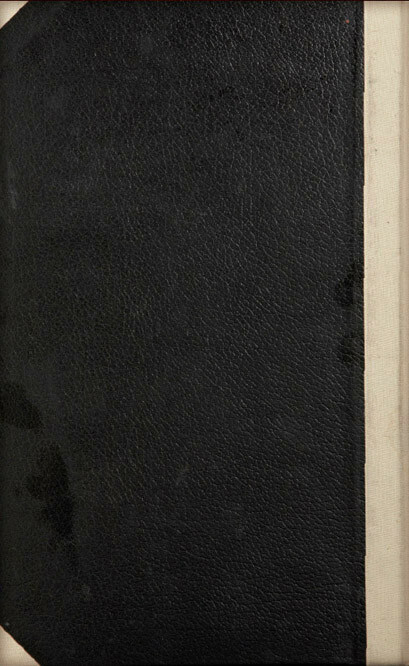 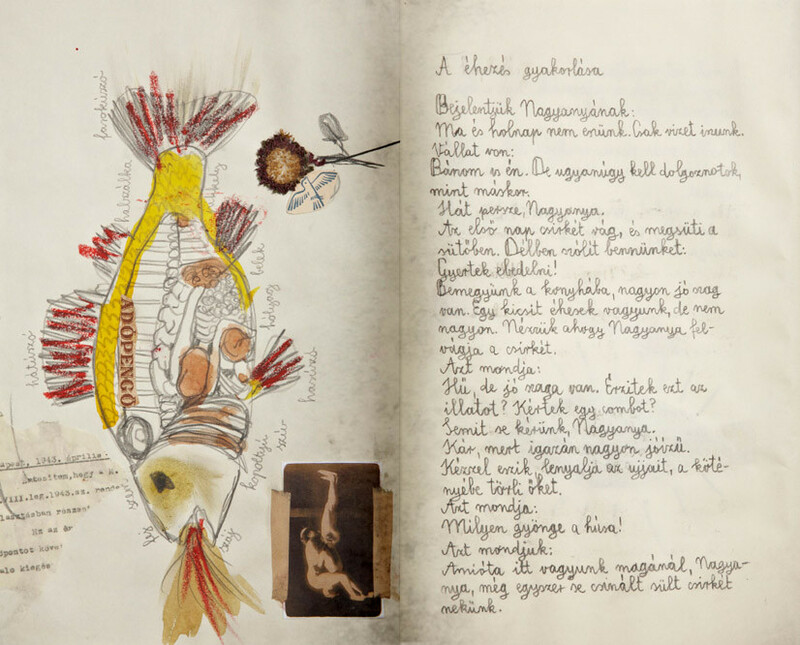 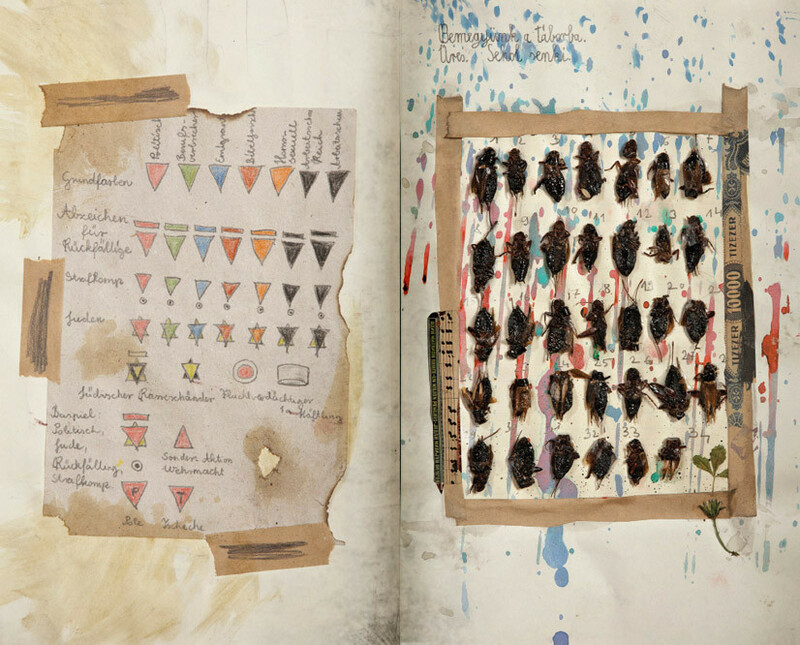 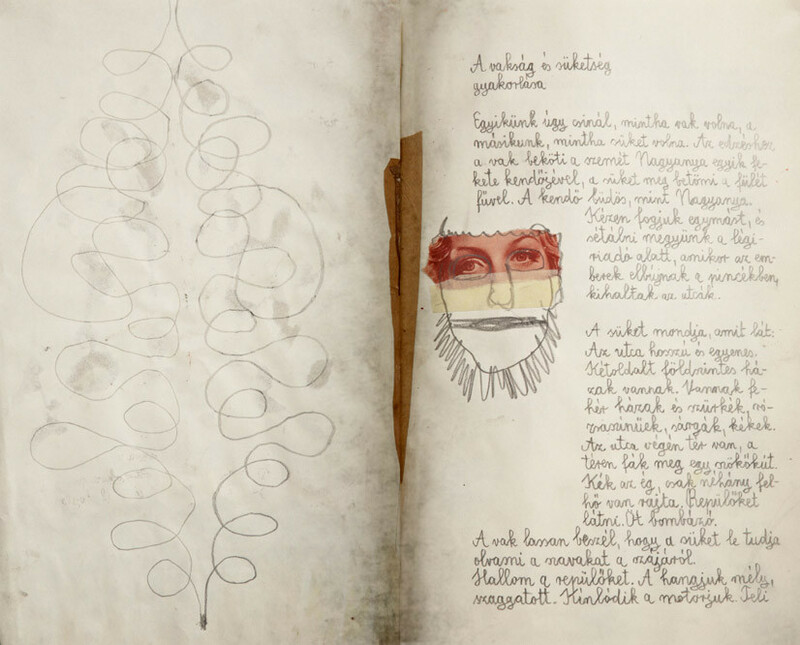 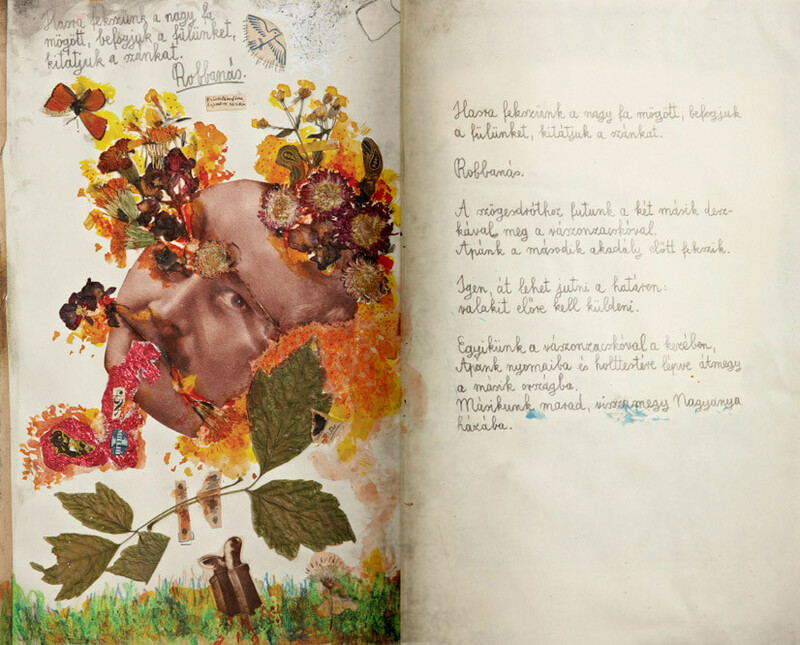 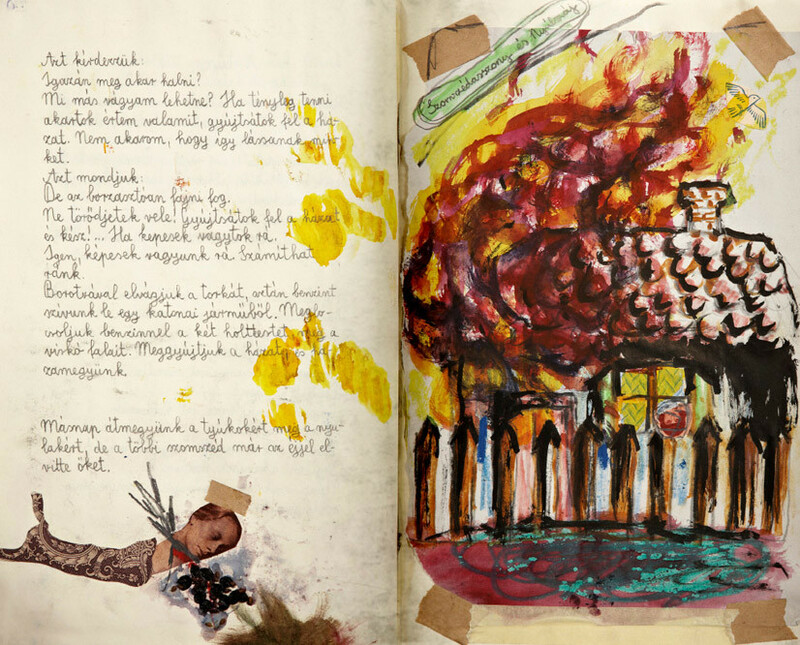 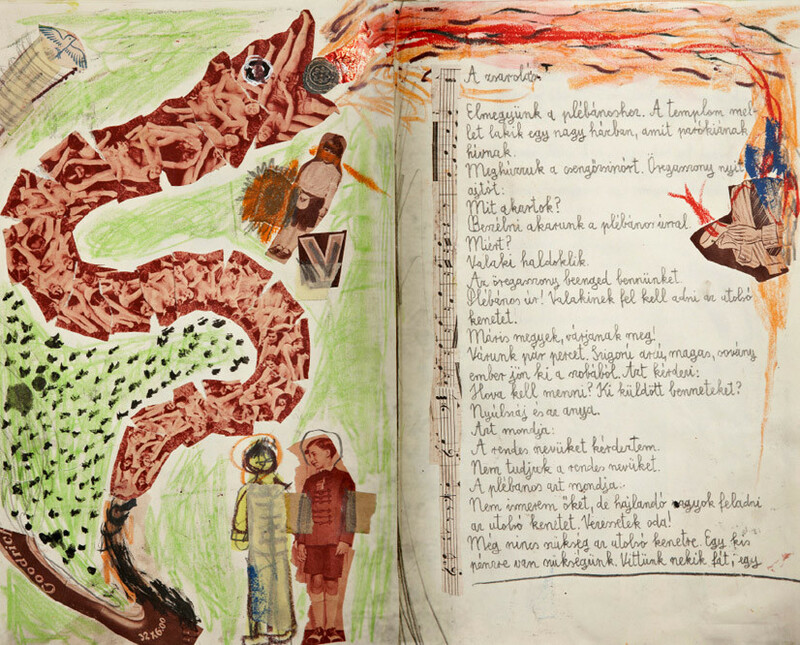 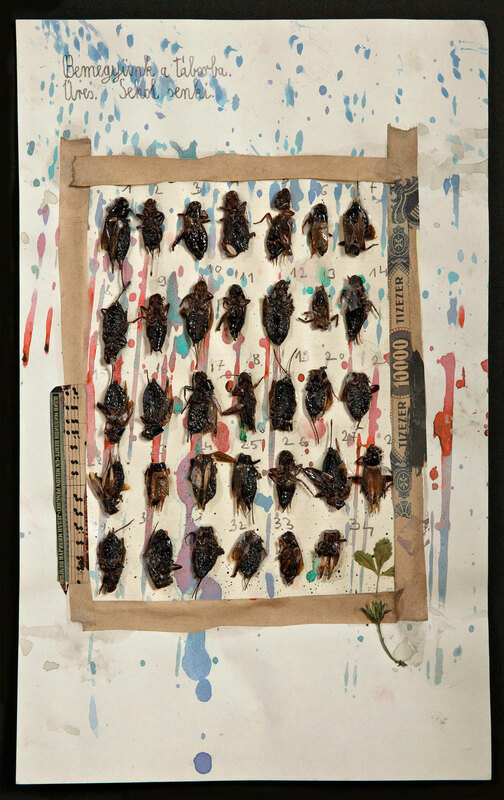 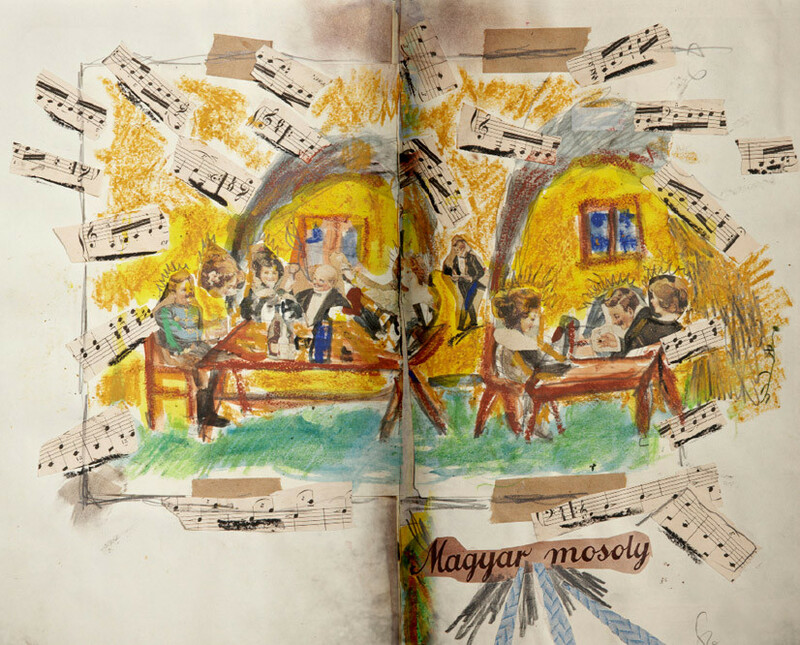 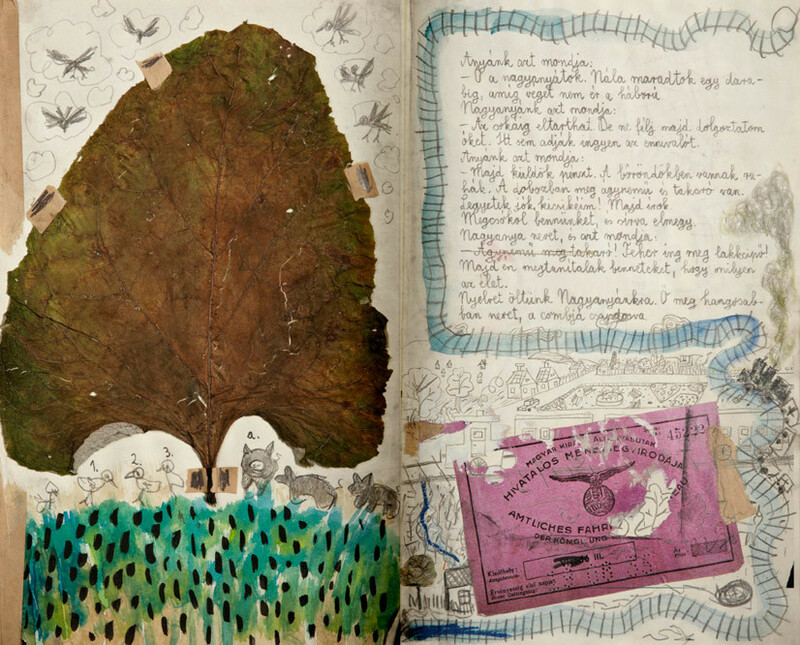 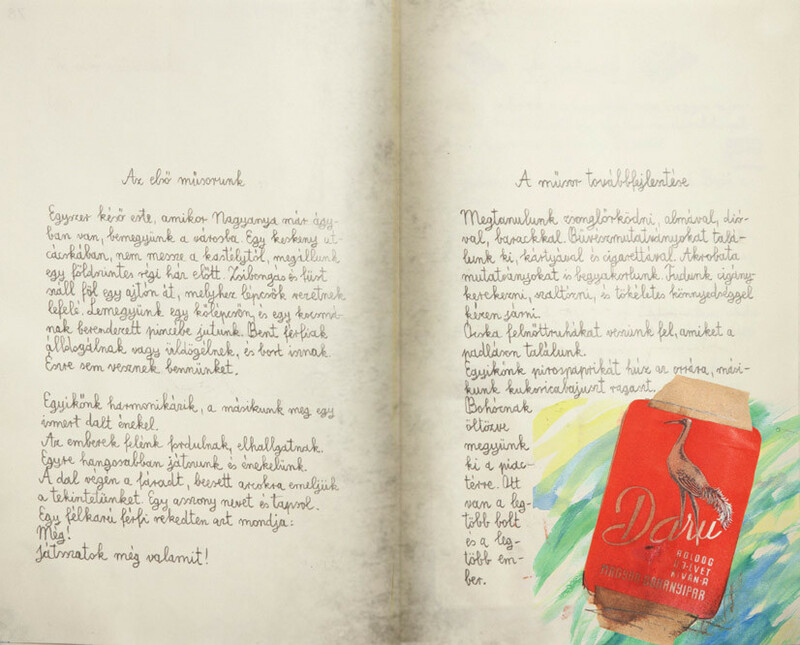 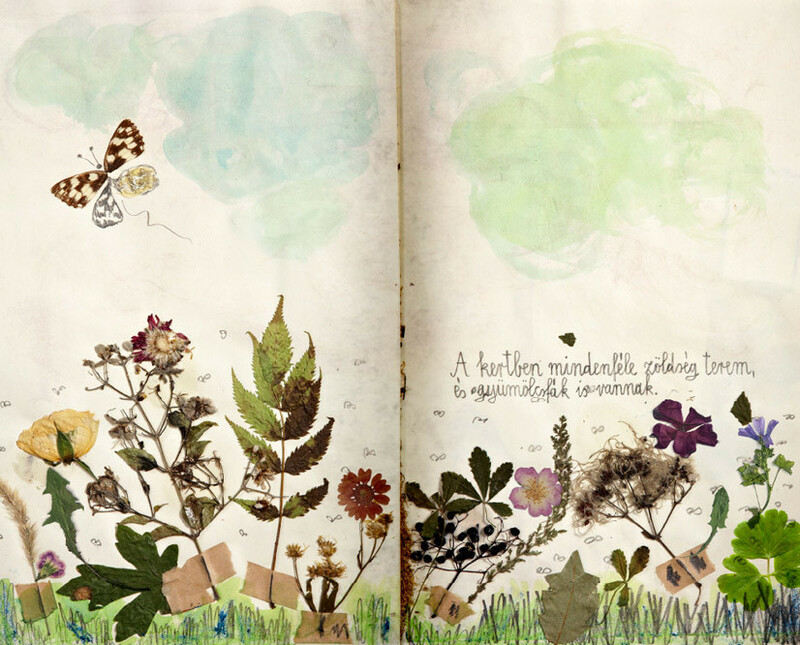 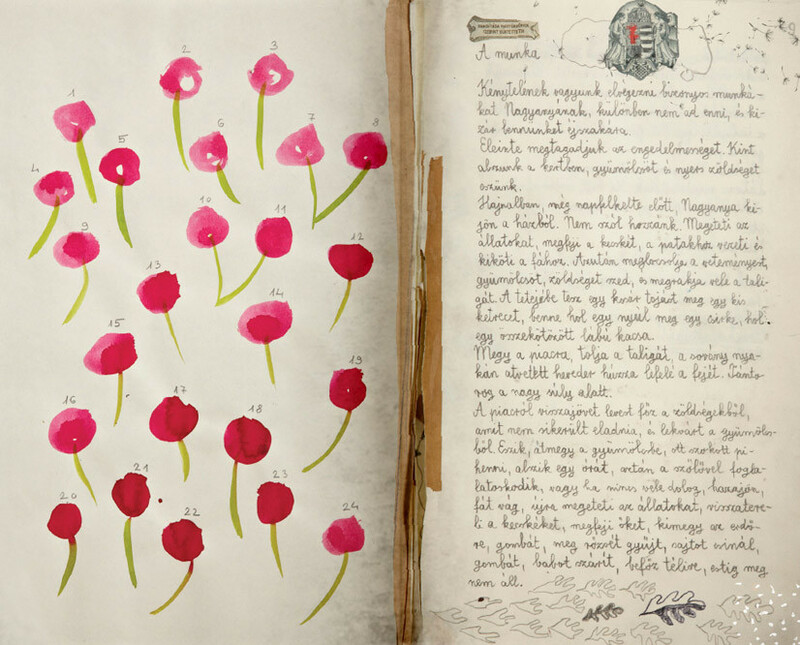 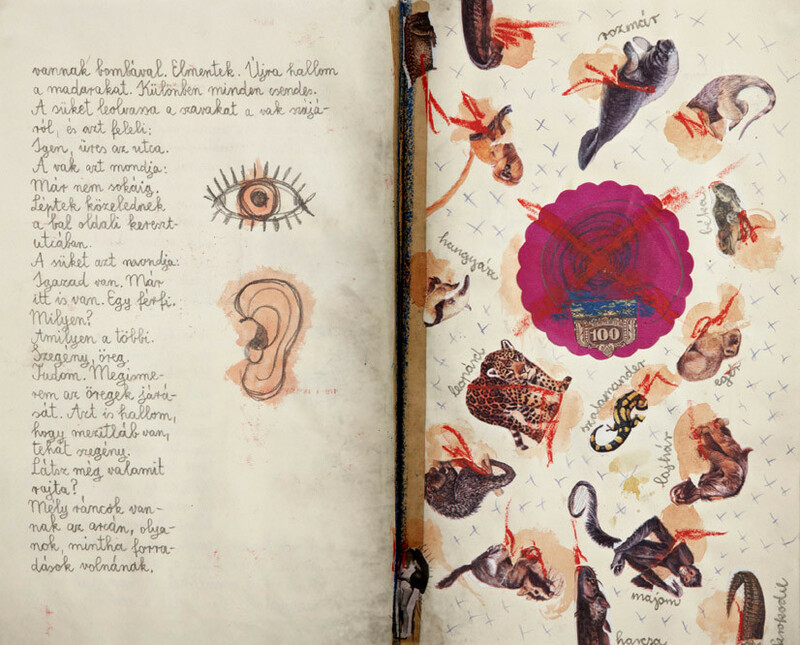 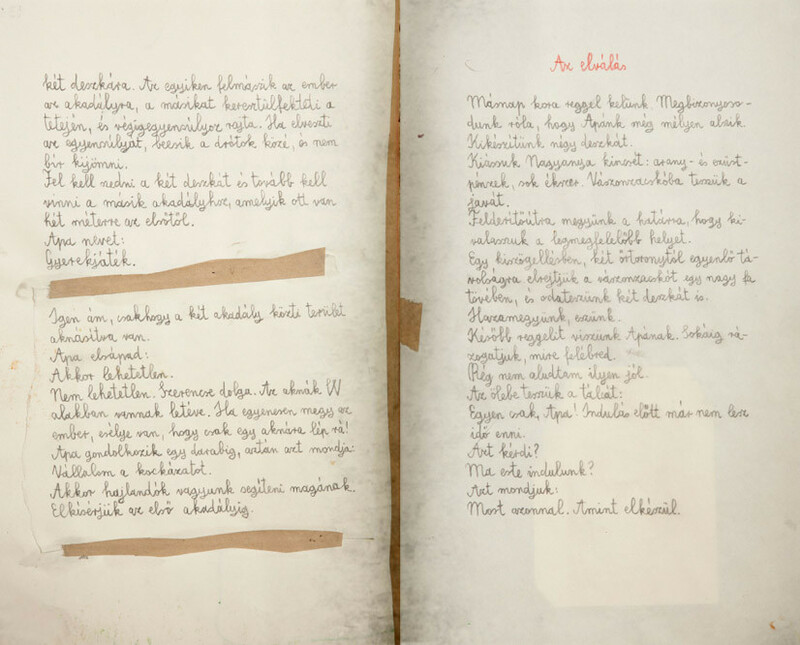 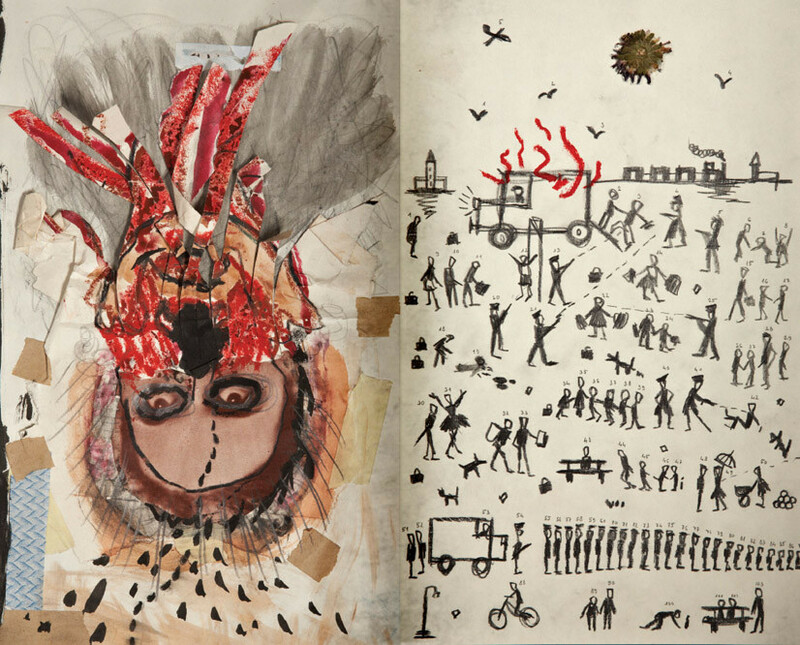 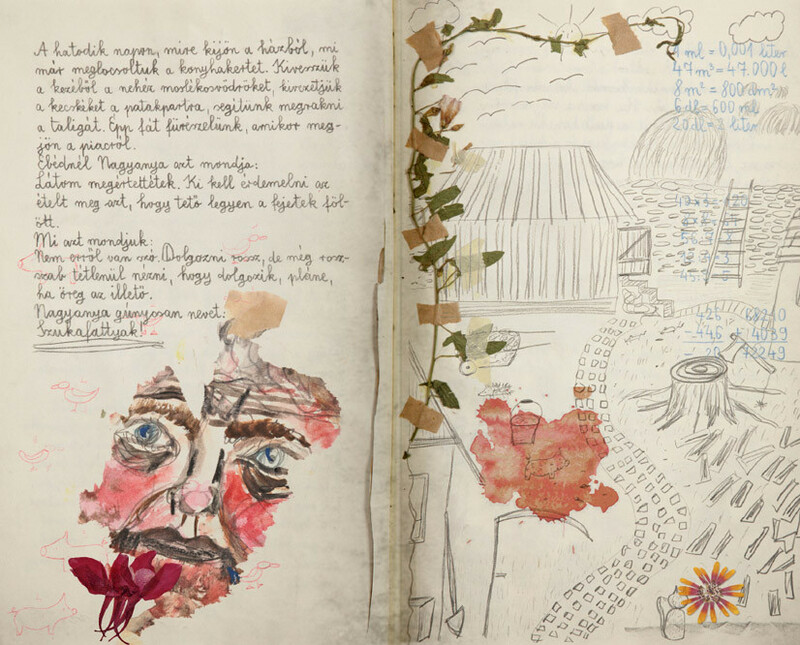 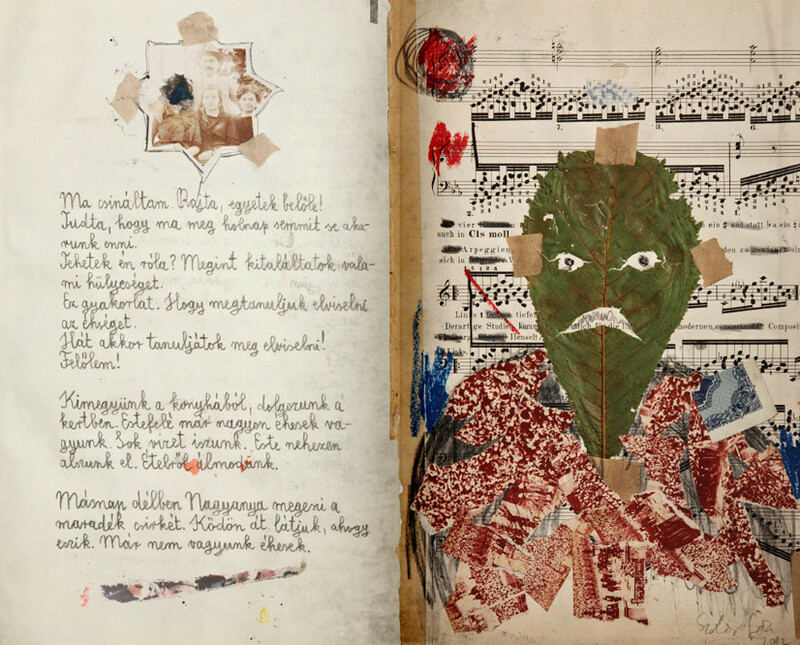 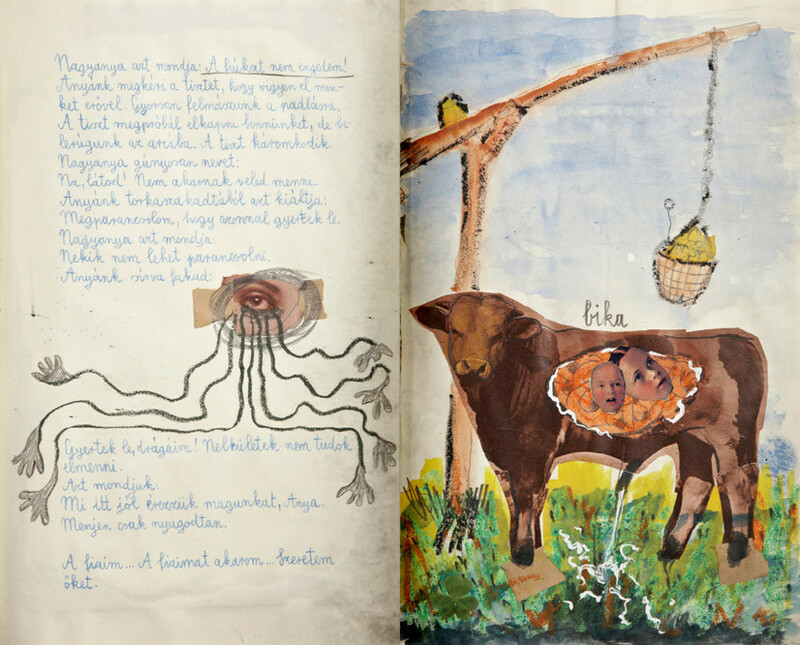 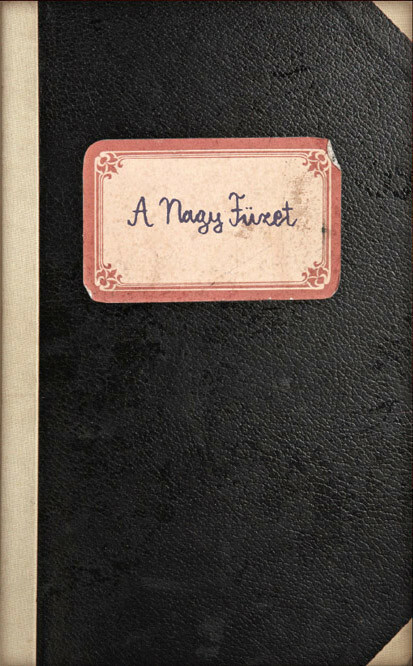 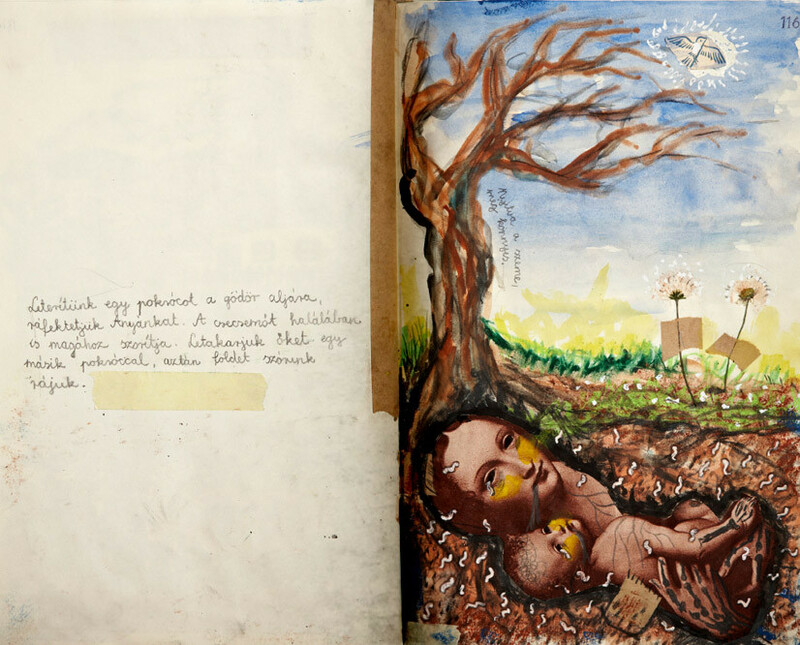 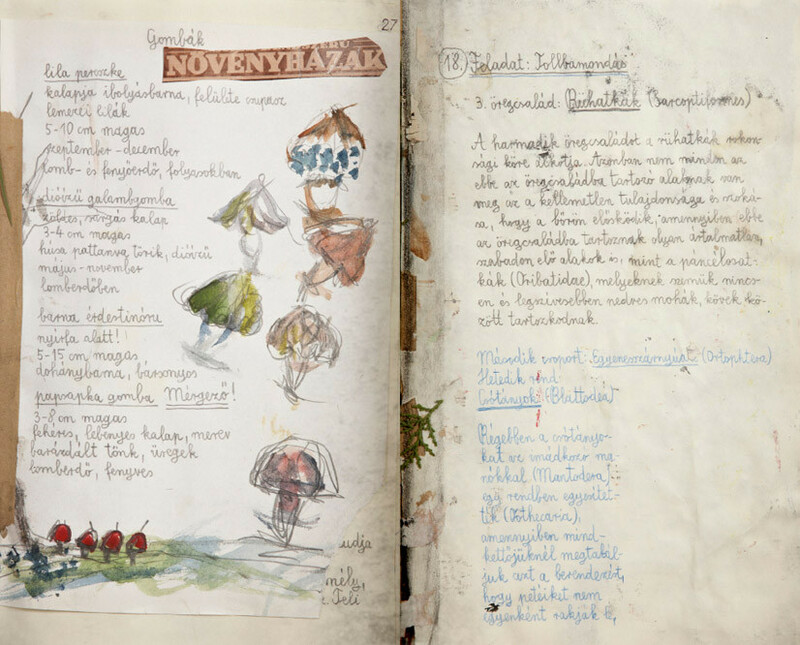 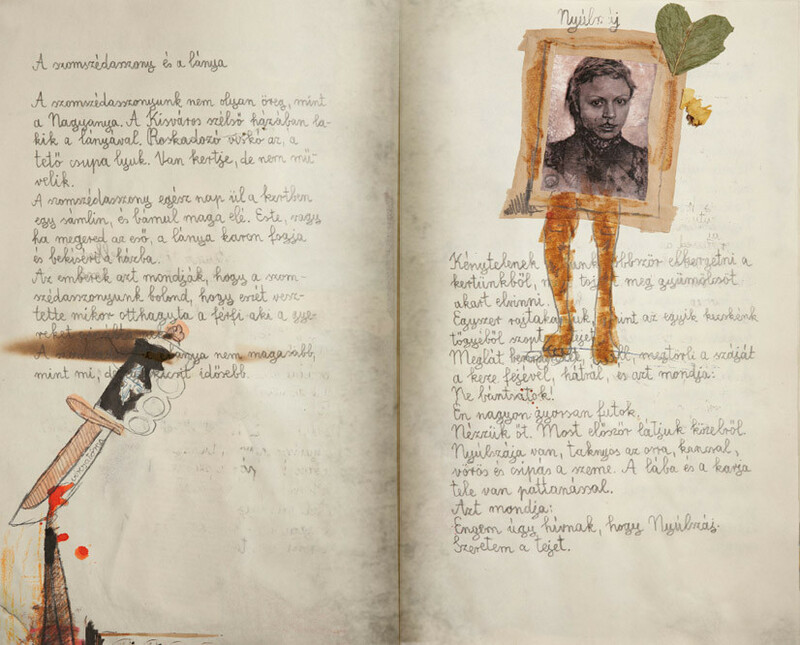 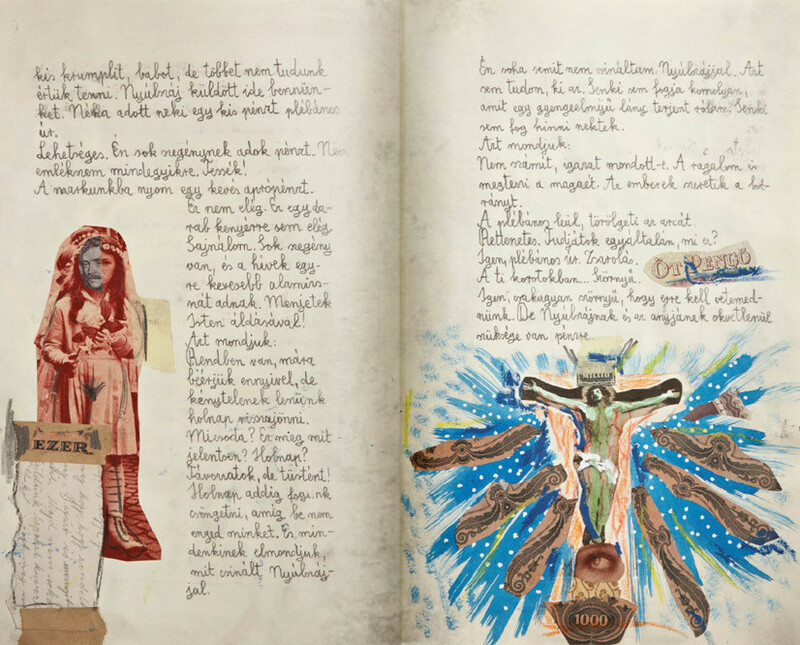 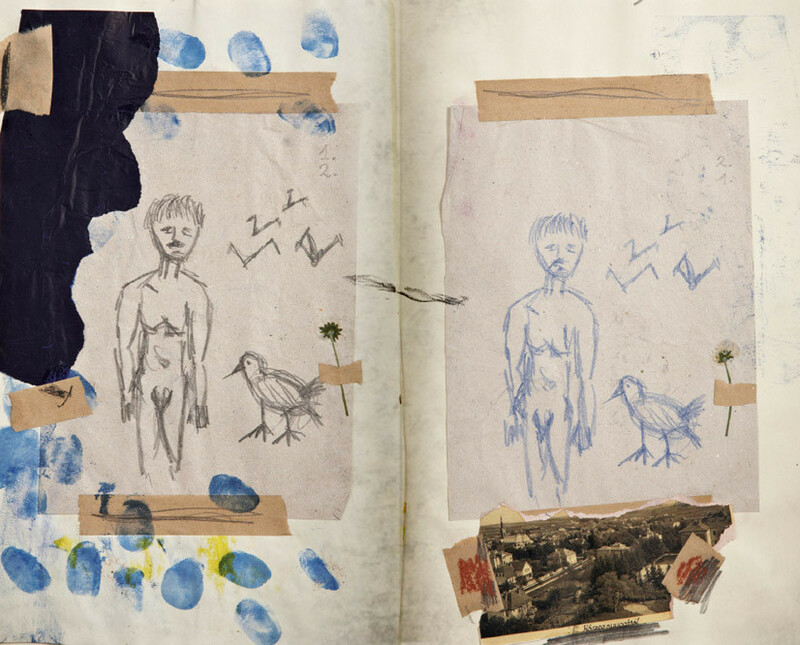 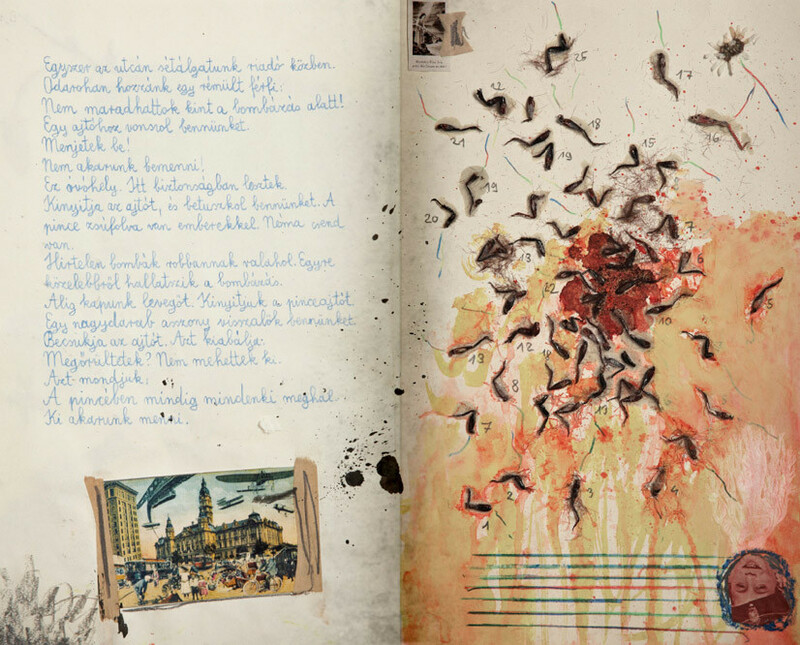 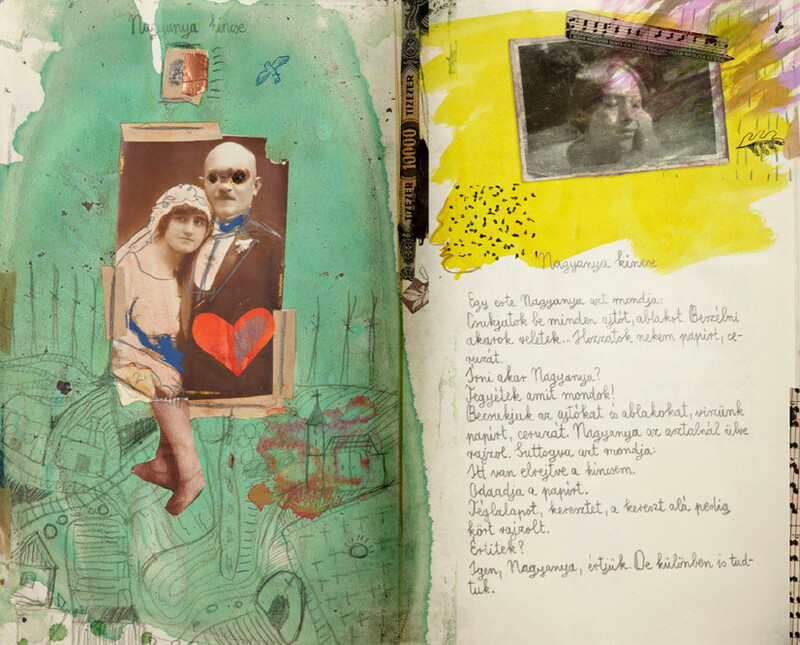 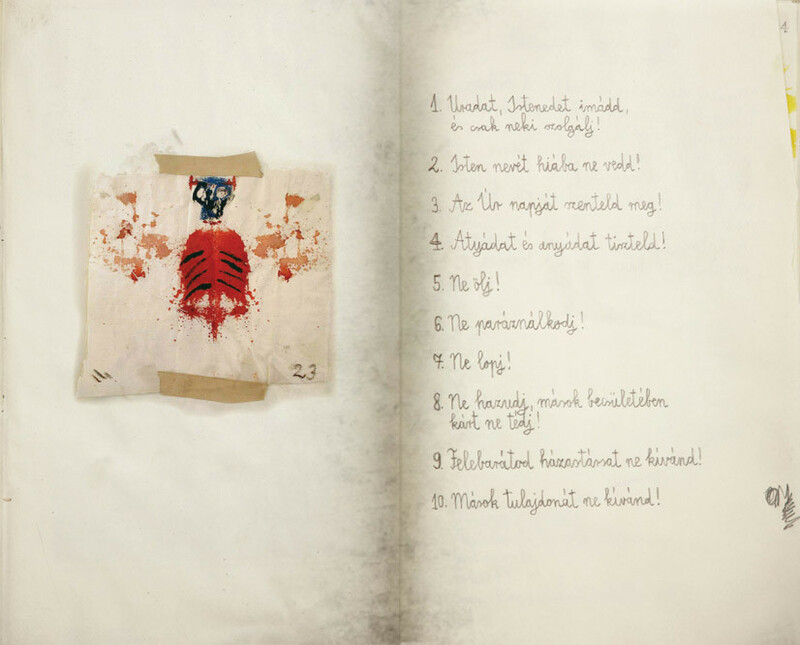 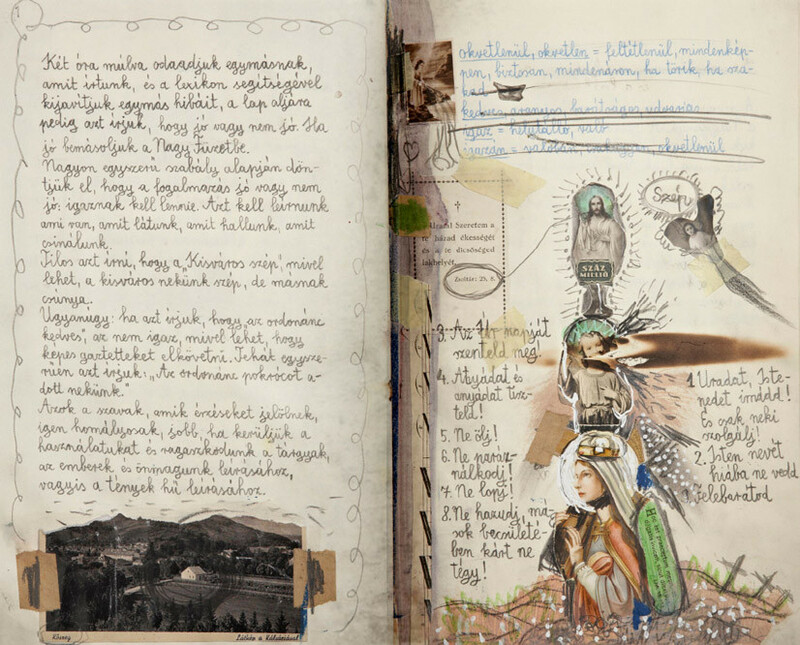 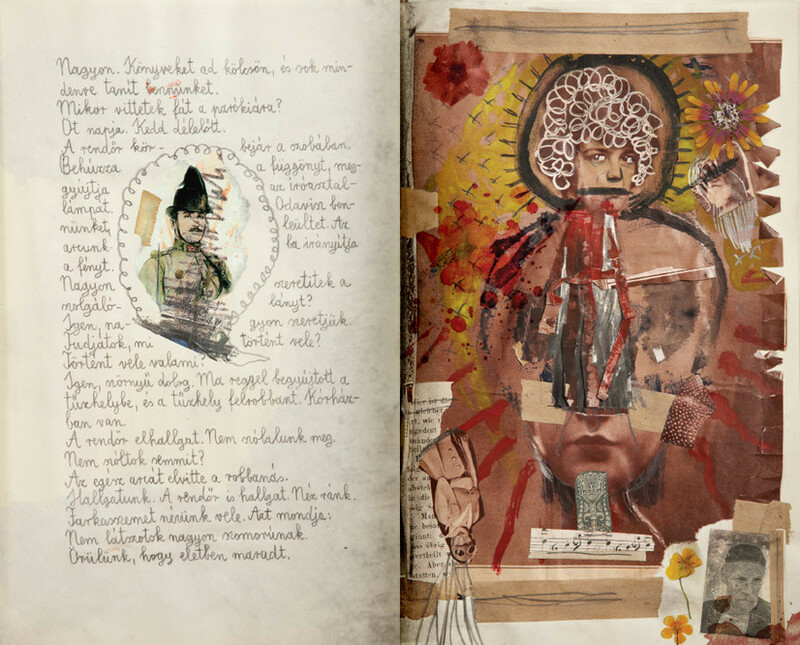 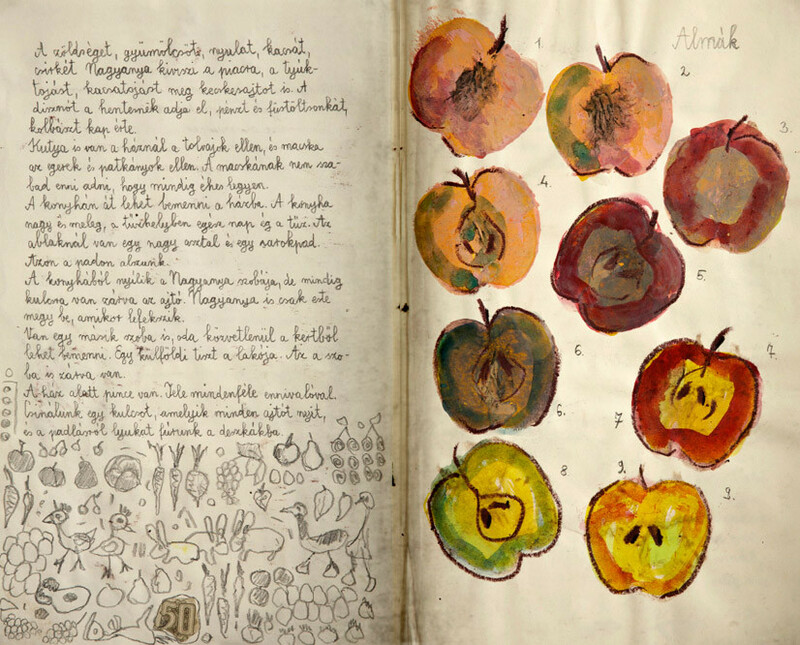 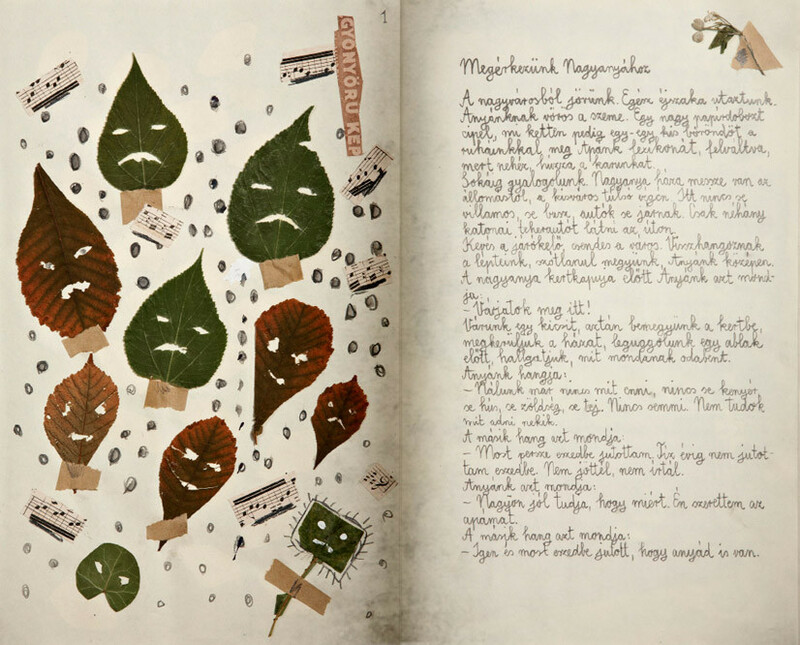 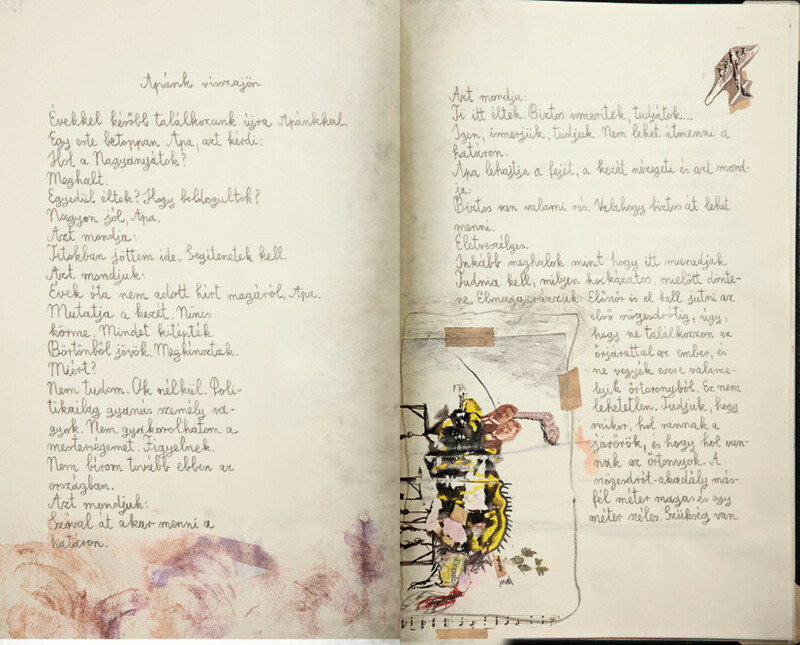 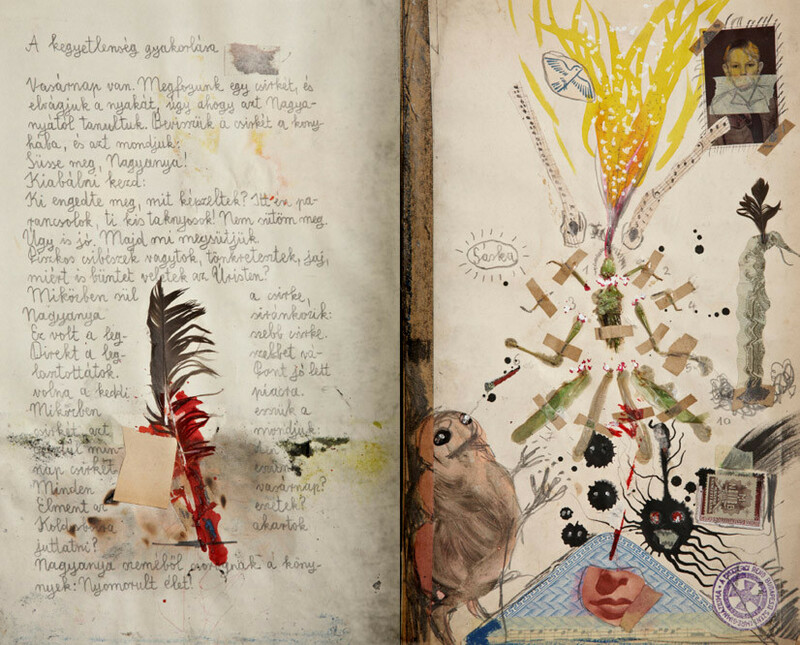 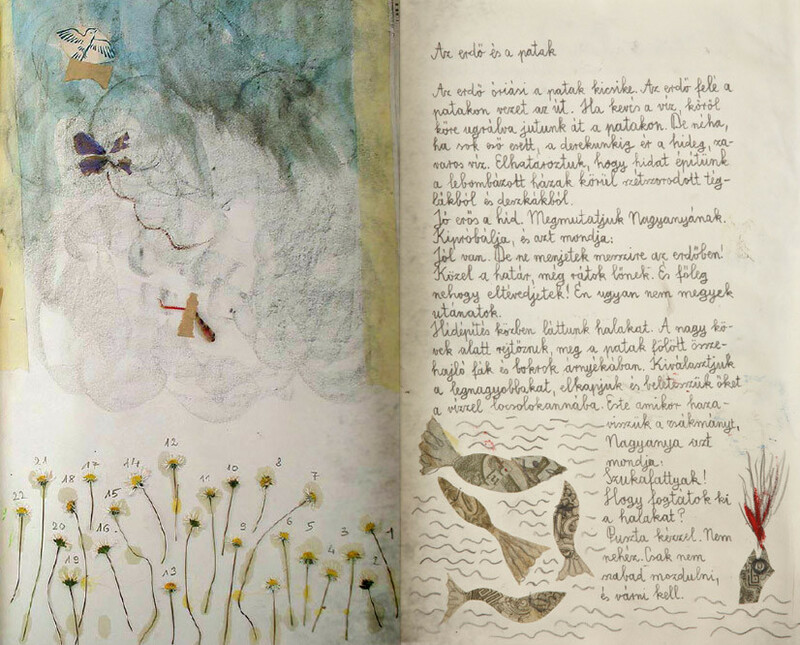 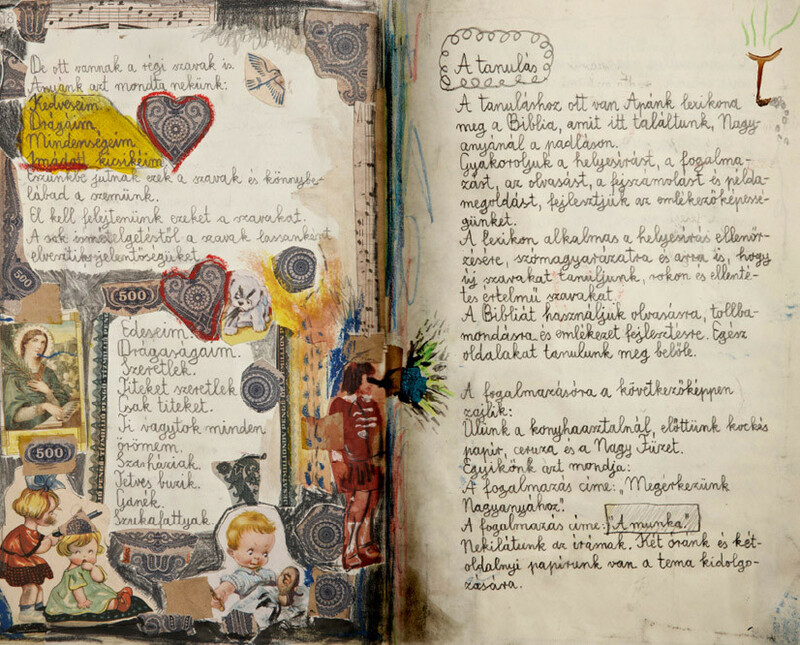 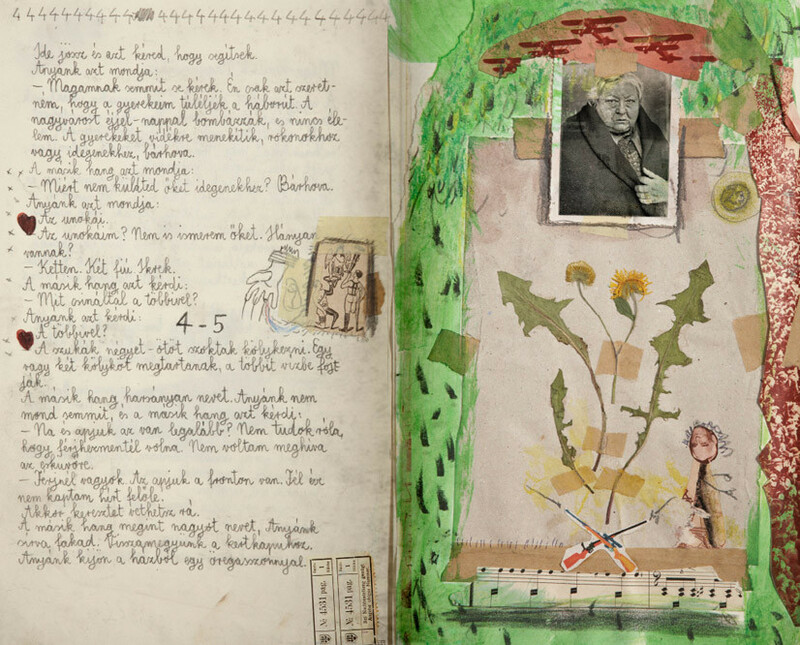 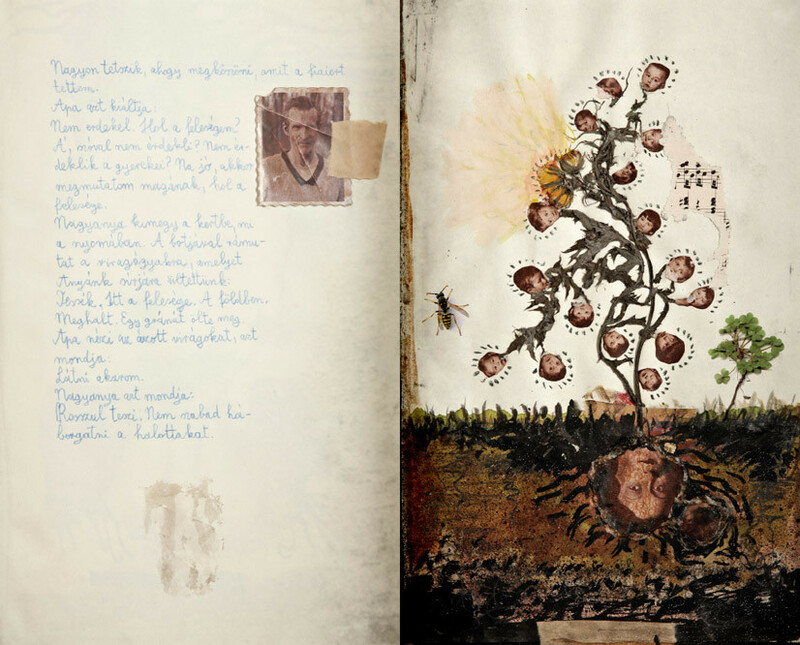 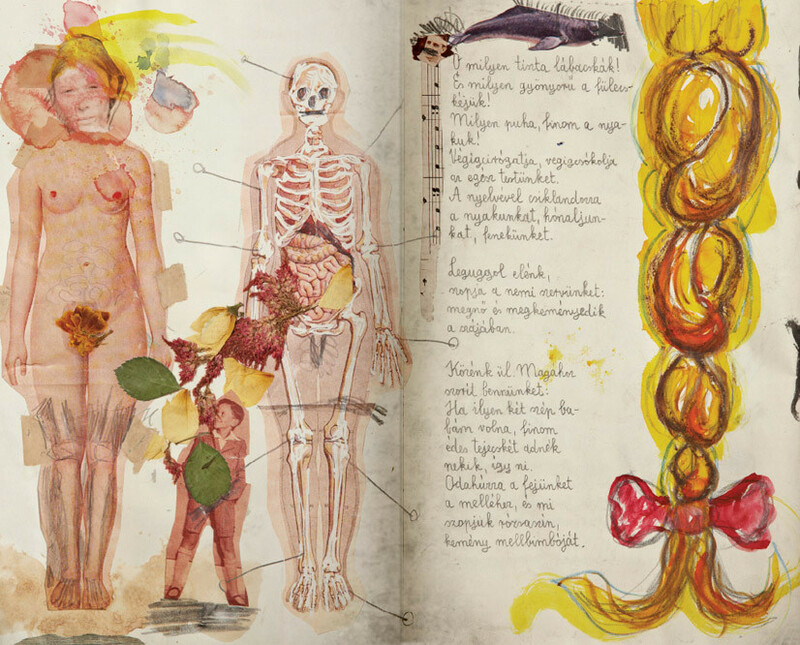 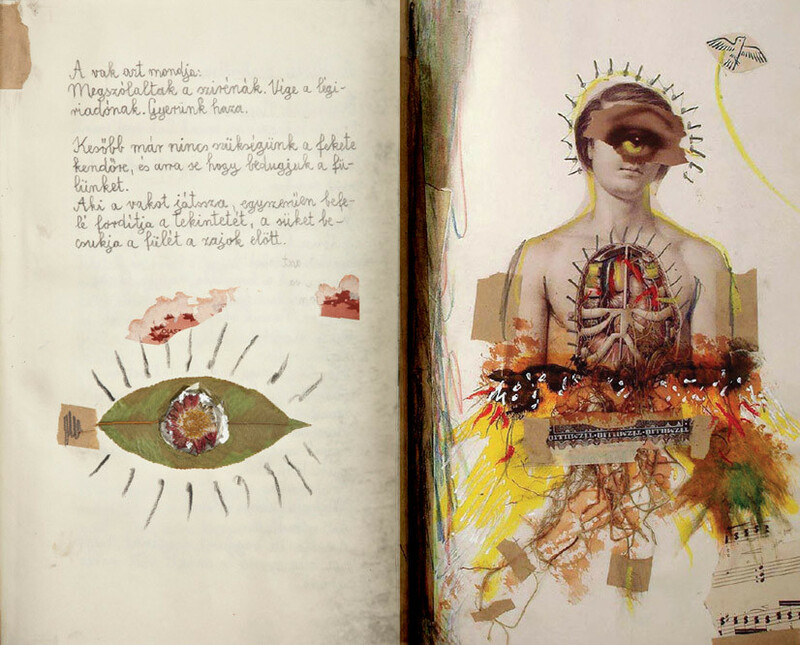 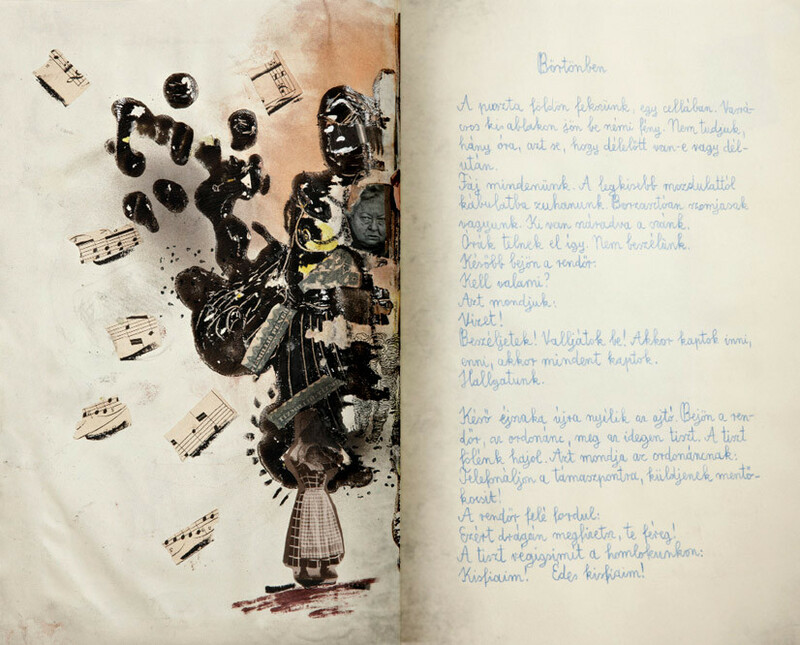 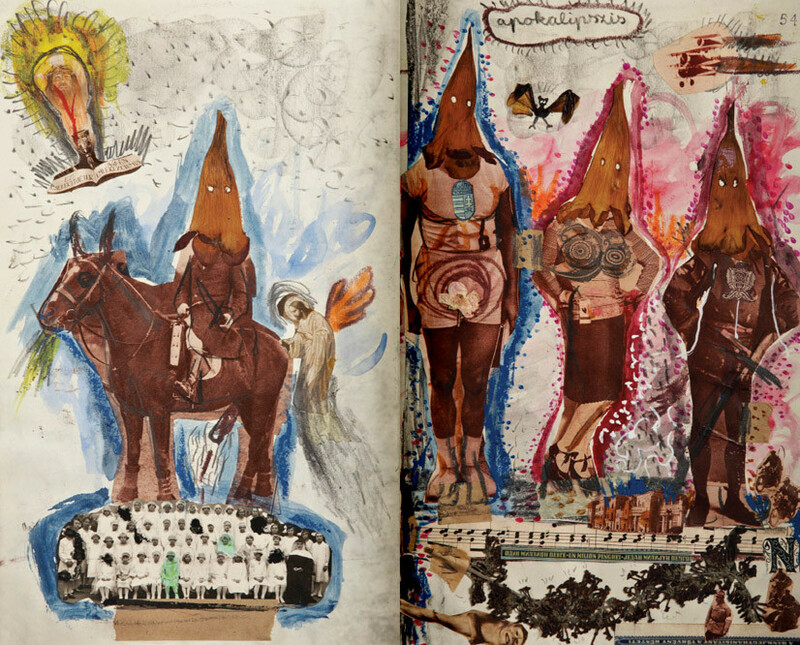 Géza Szöllősi's piece, The big notebook, was inspired by the novel of Ágota Kristóf bearing the same name. 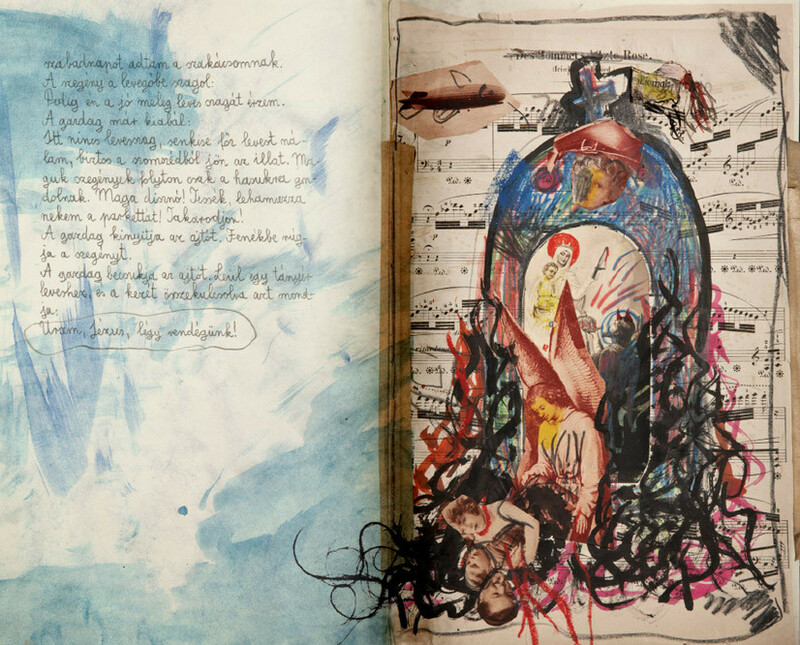 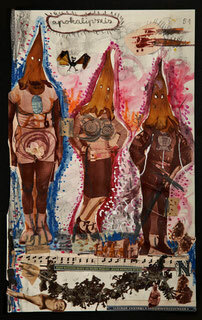 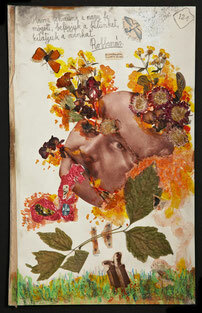 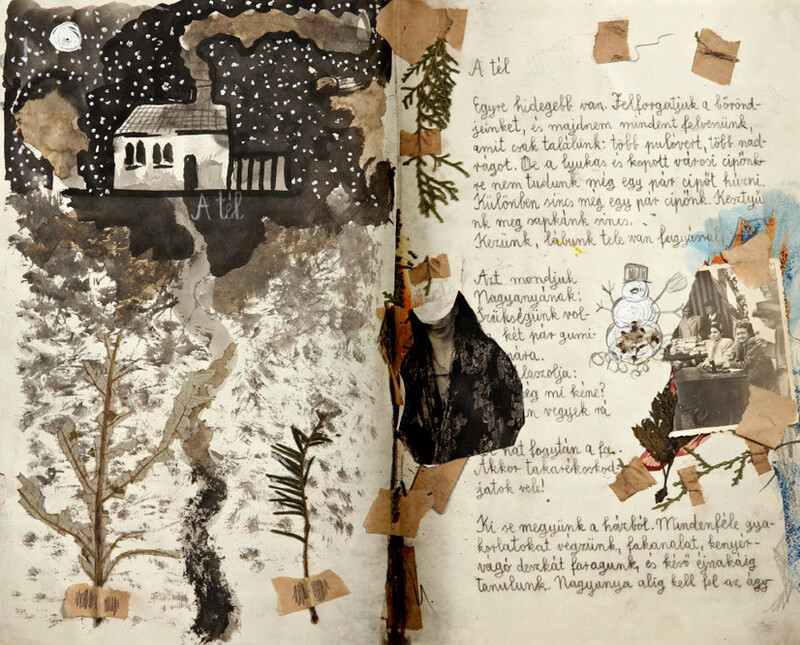 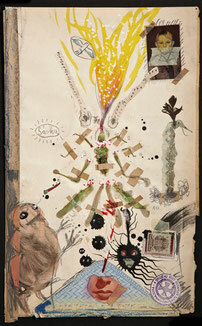 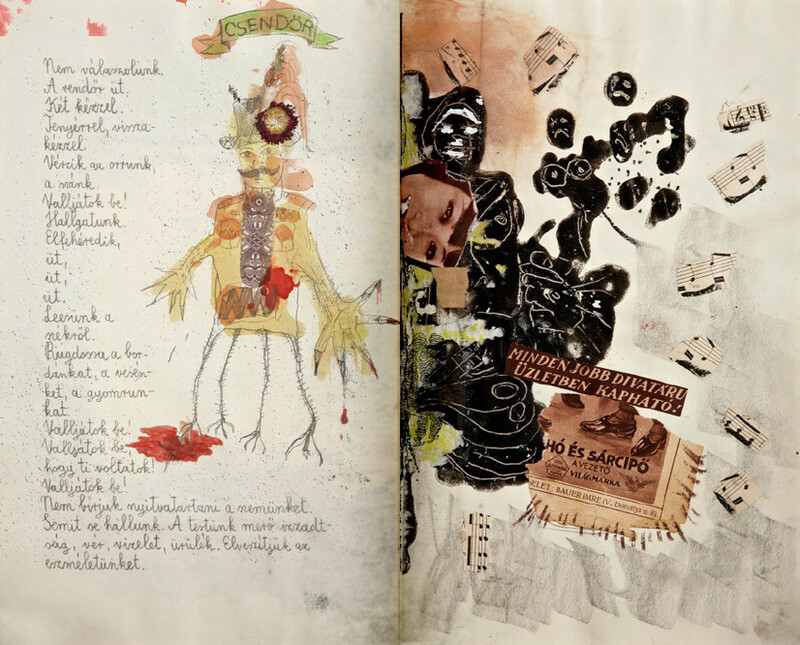 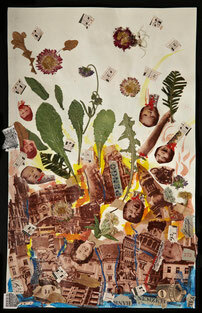 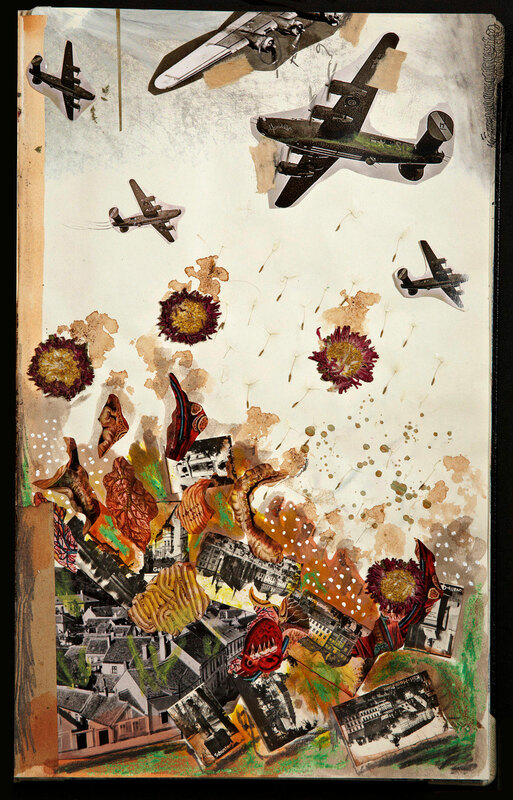 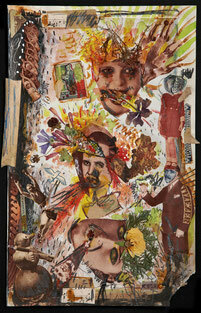 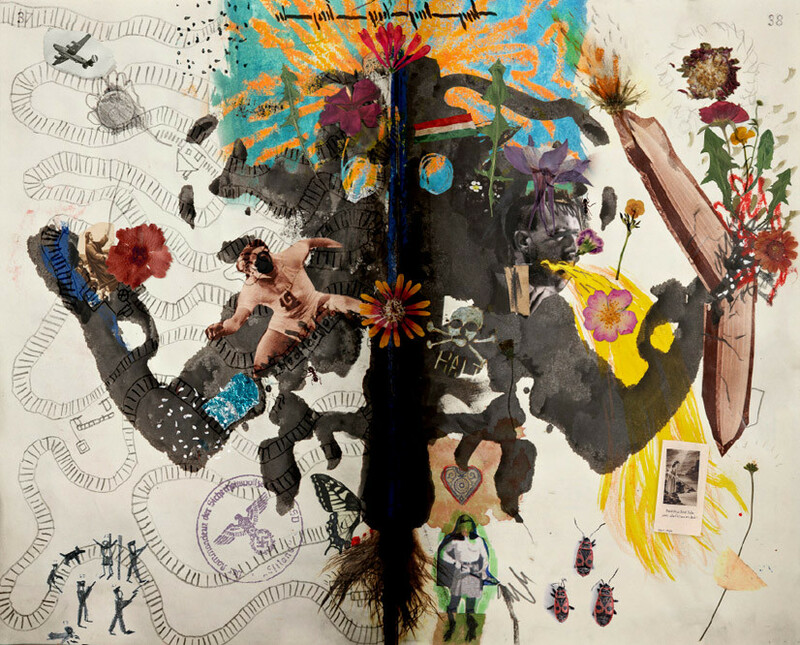 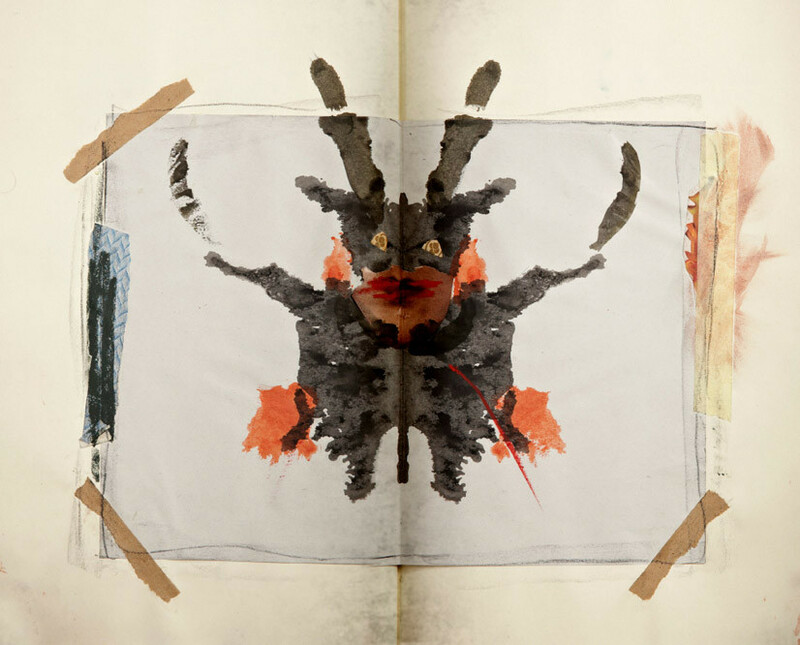 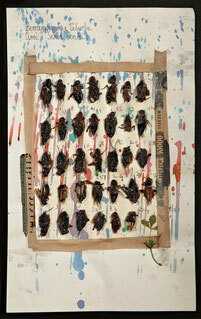 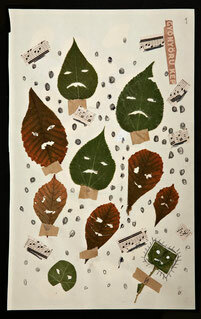 This artwork is the outcome of those experiences triggered by the reading process. 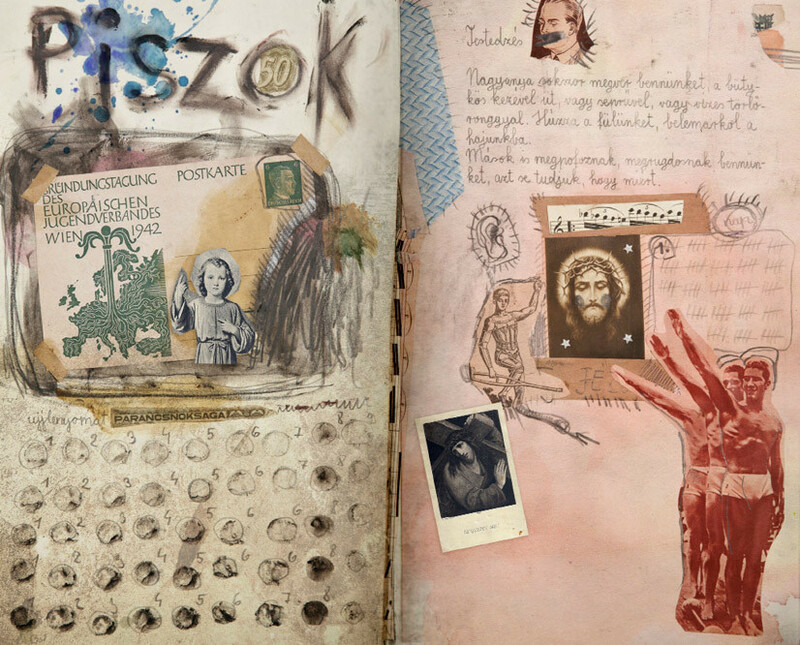 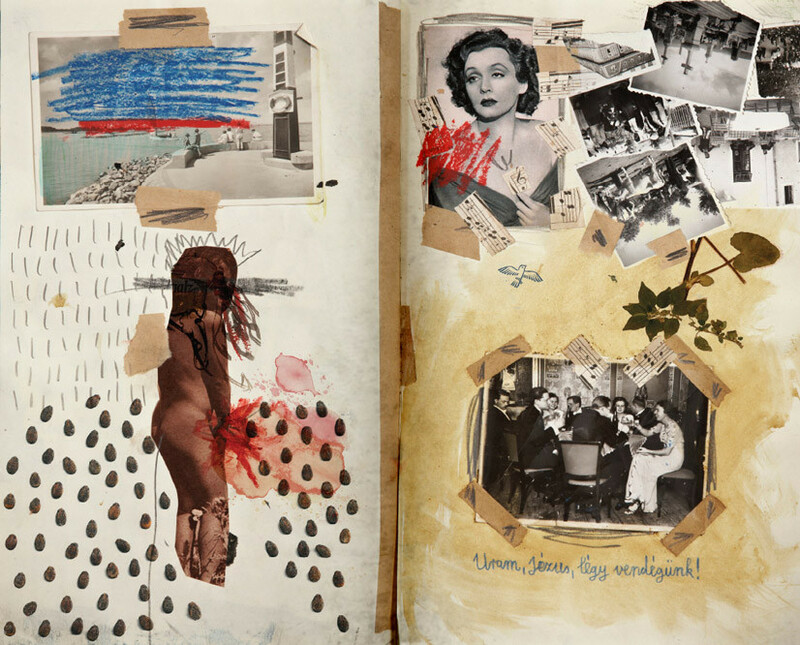 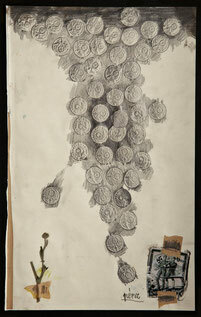 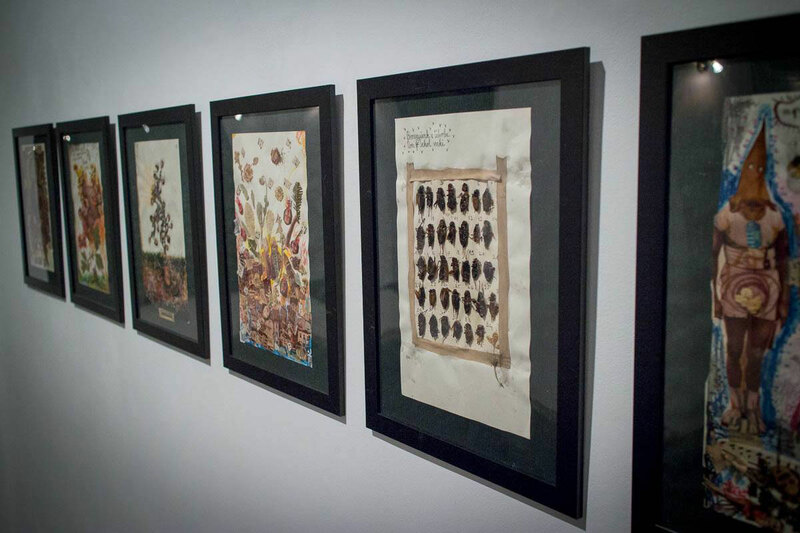 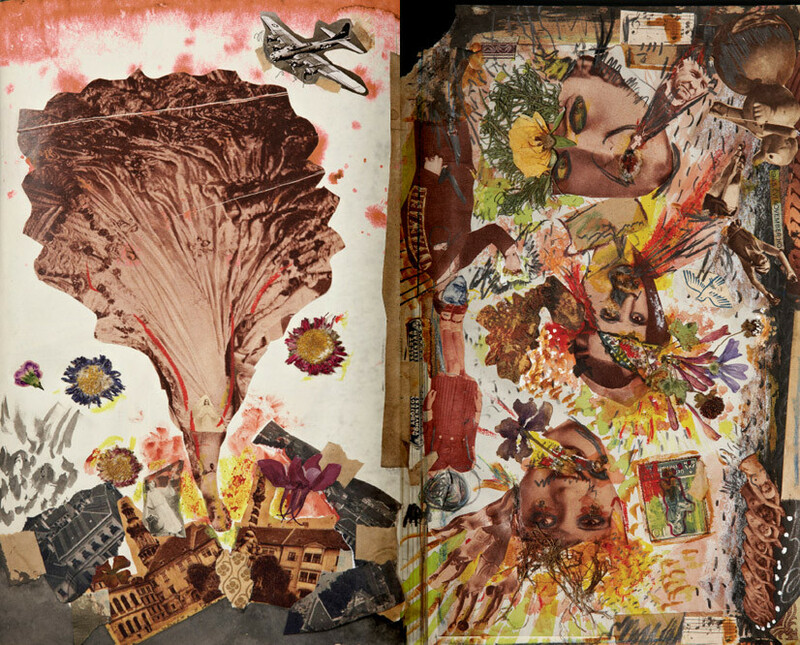 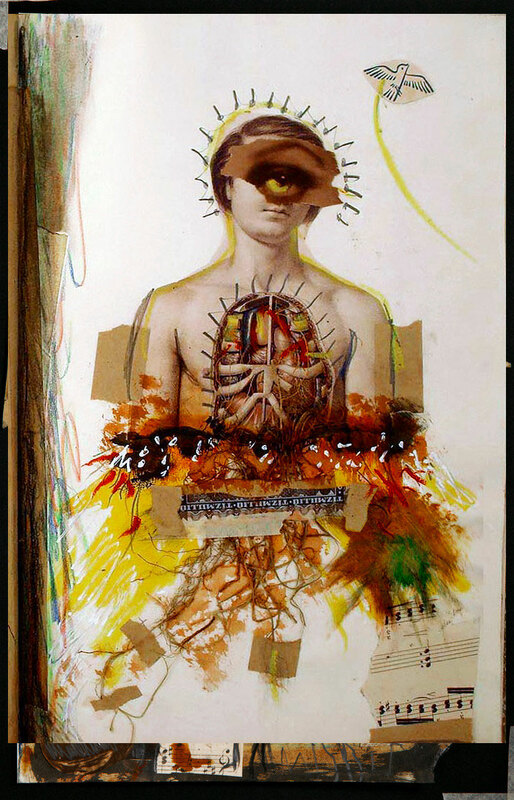 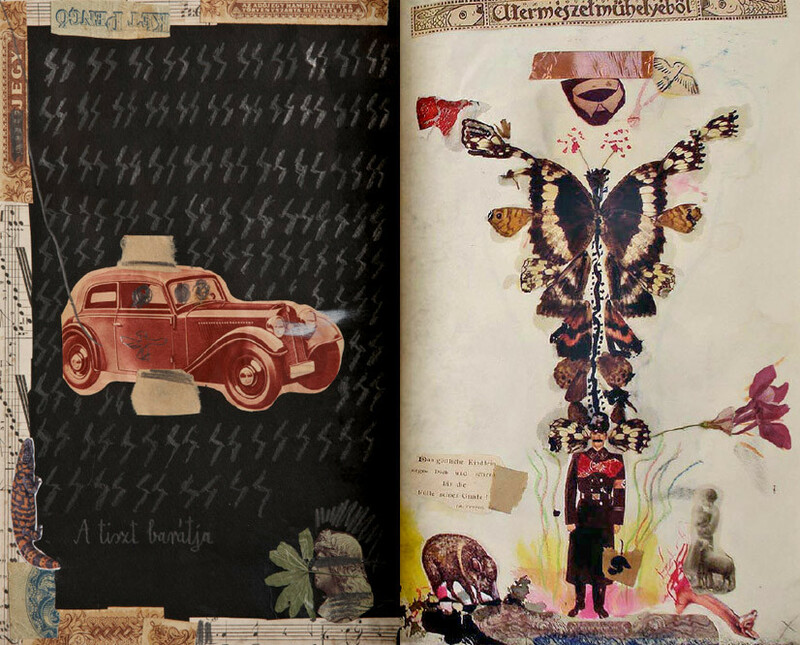 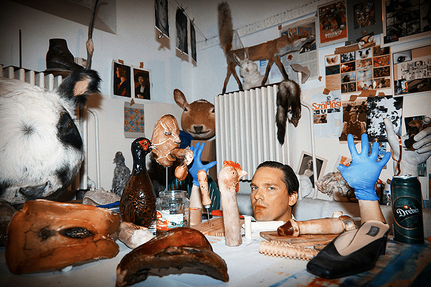 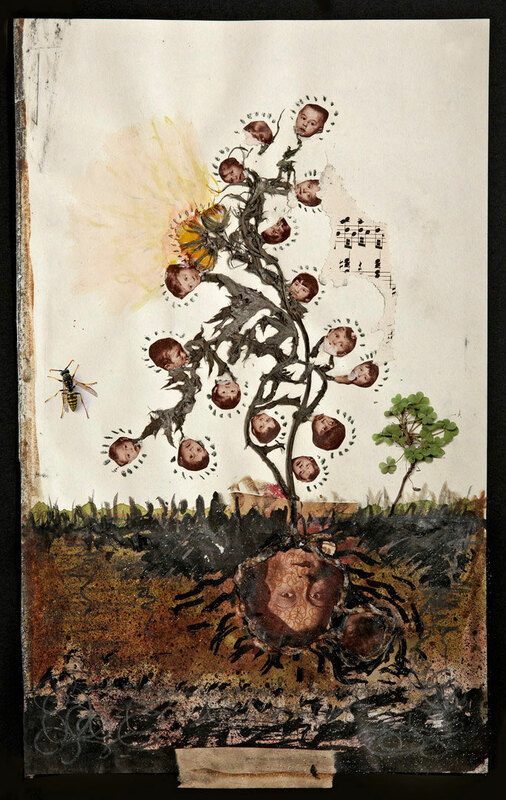 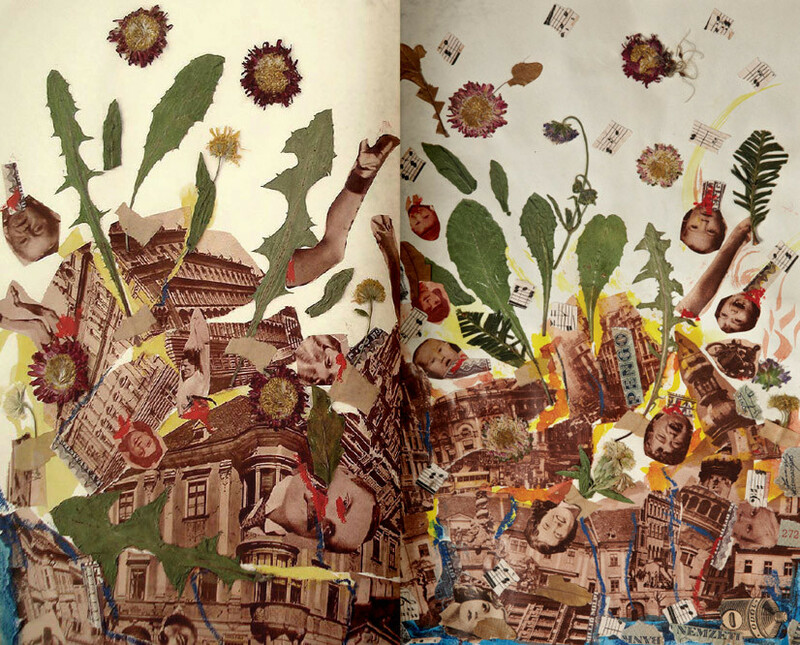 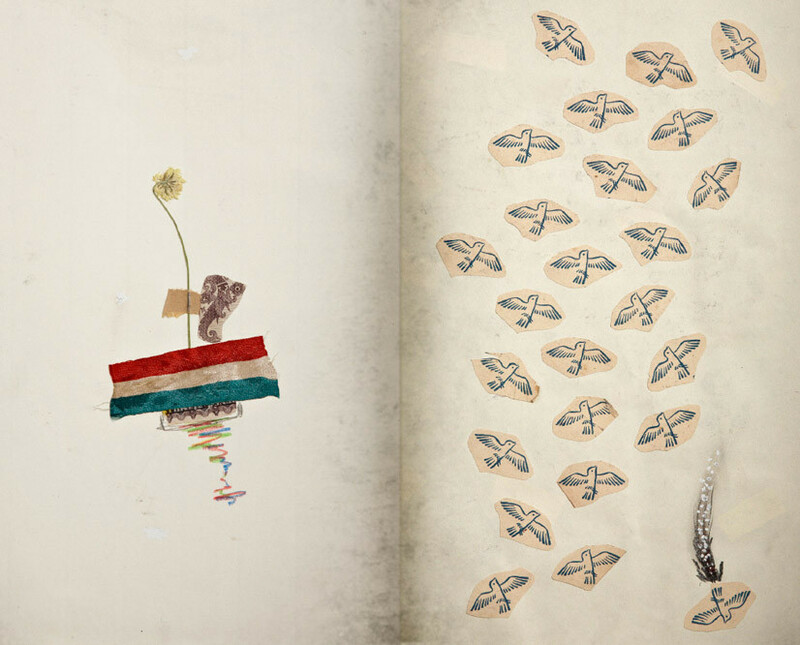 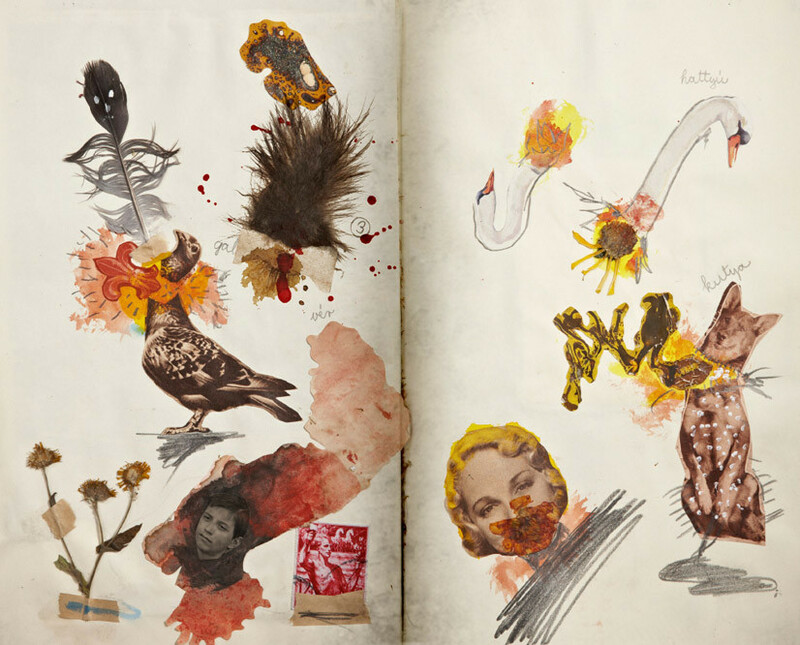 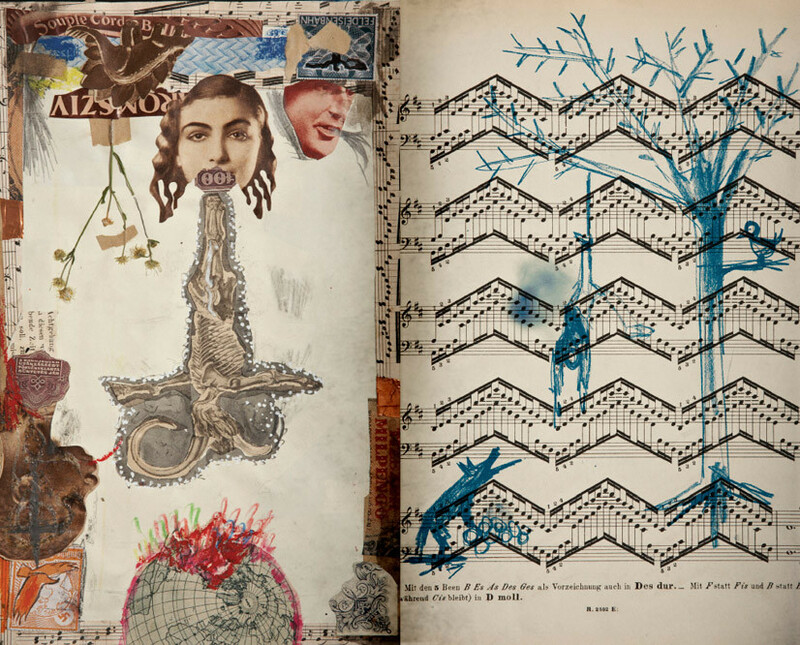 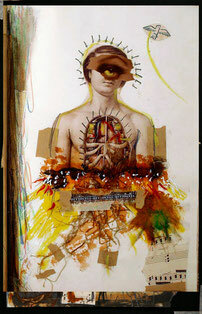 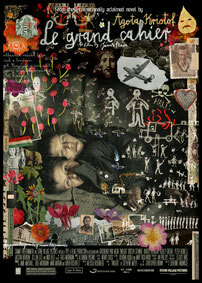 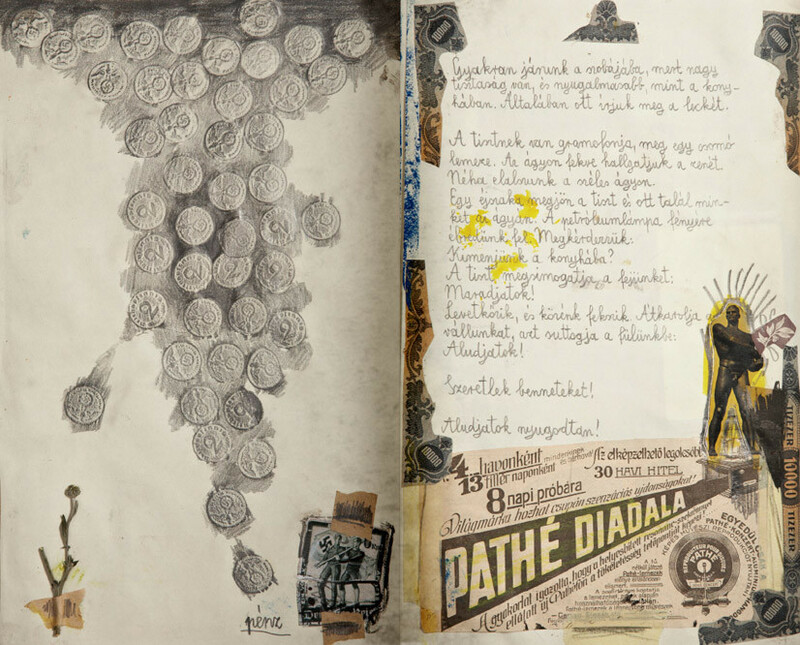 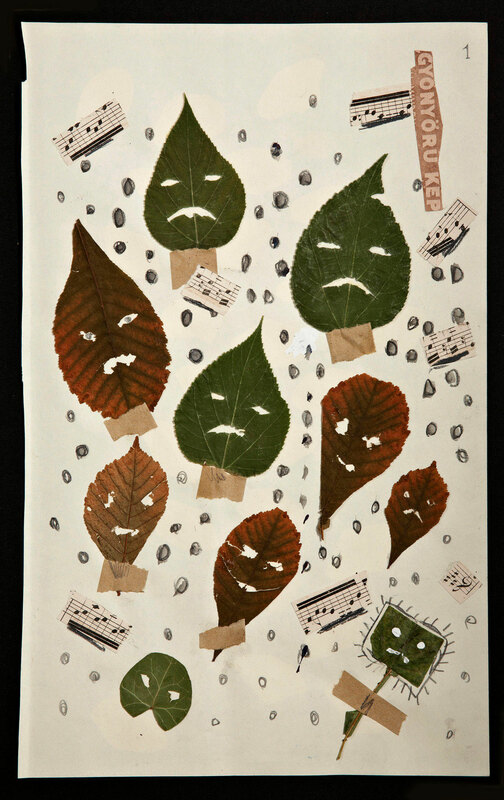 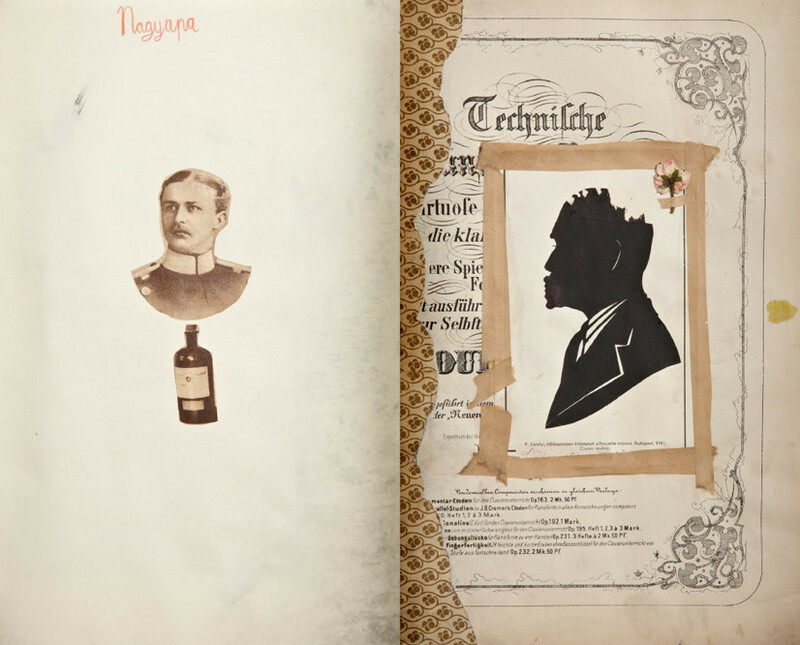 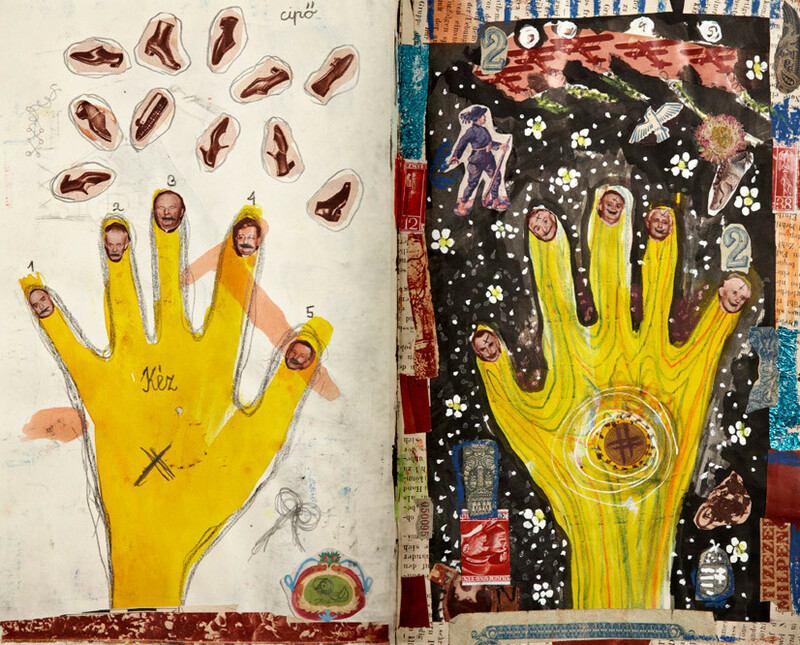 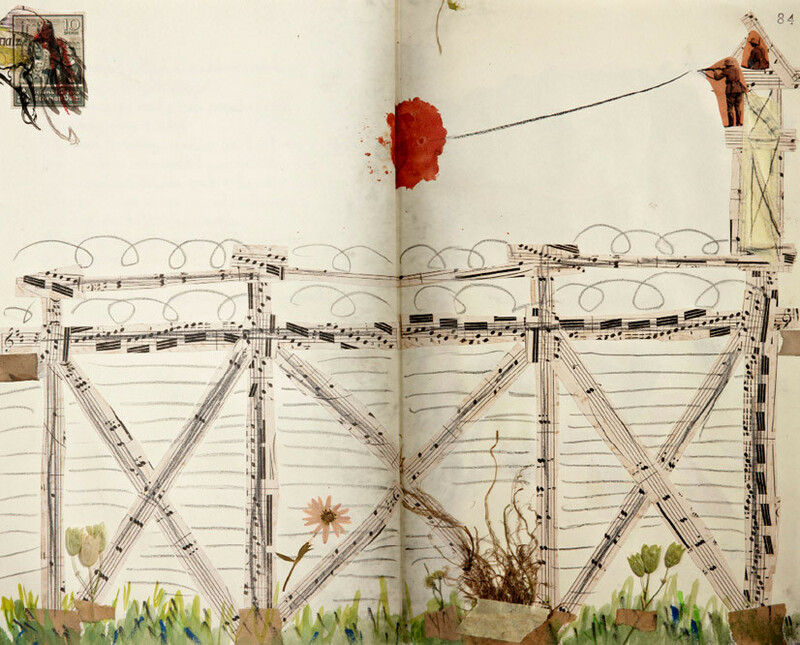 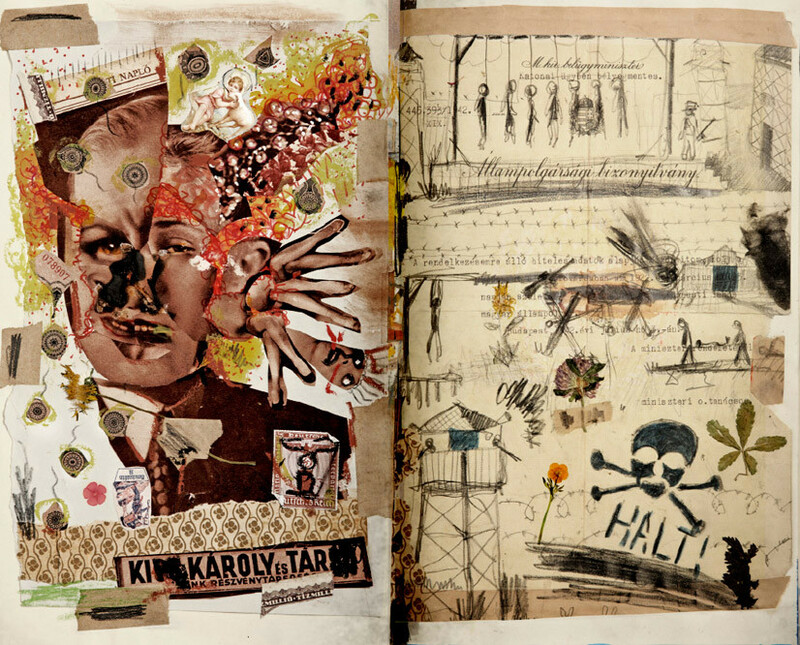 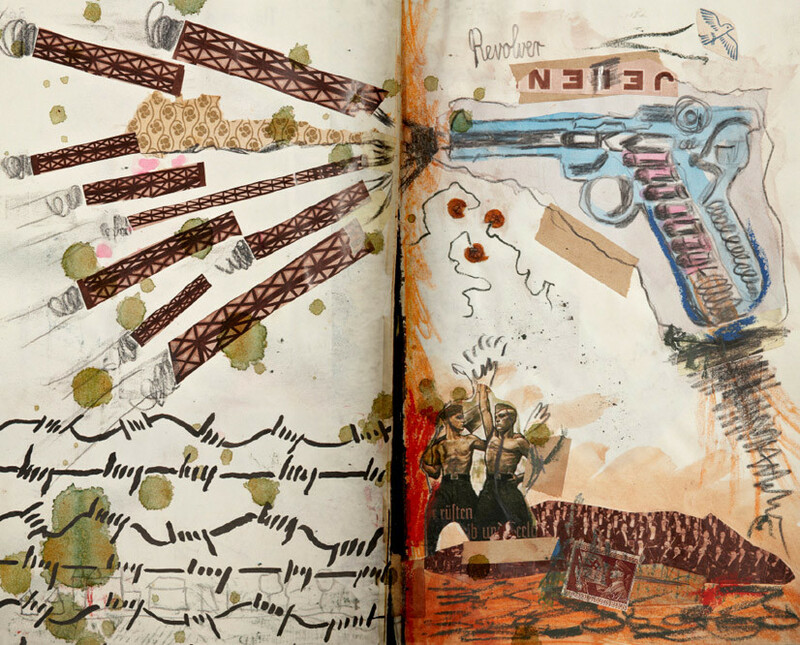 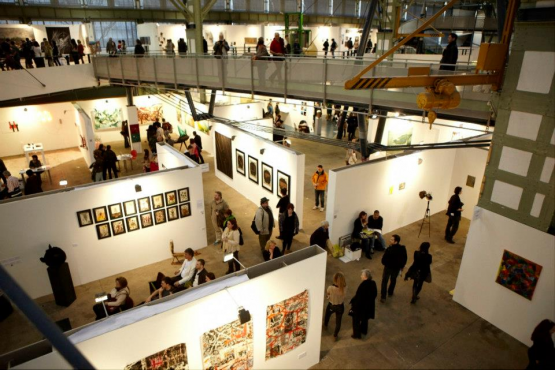 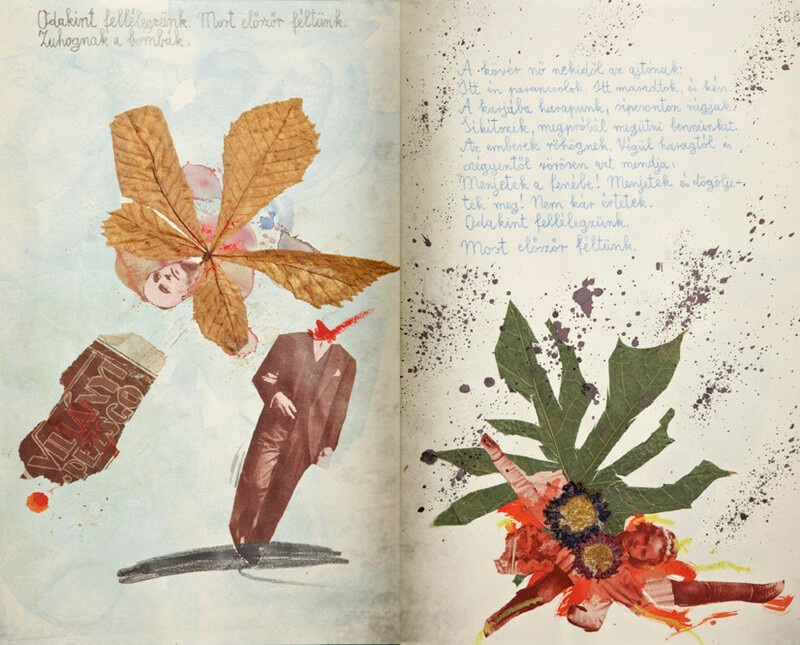 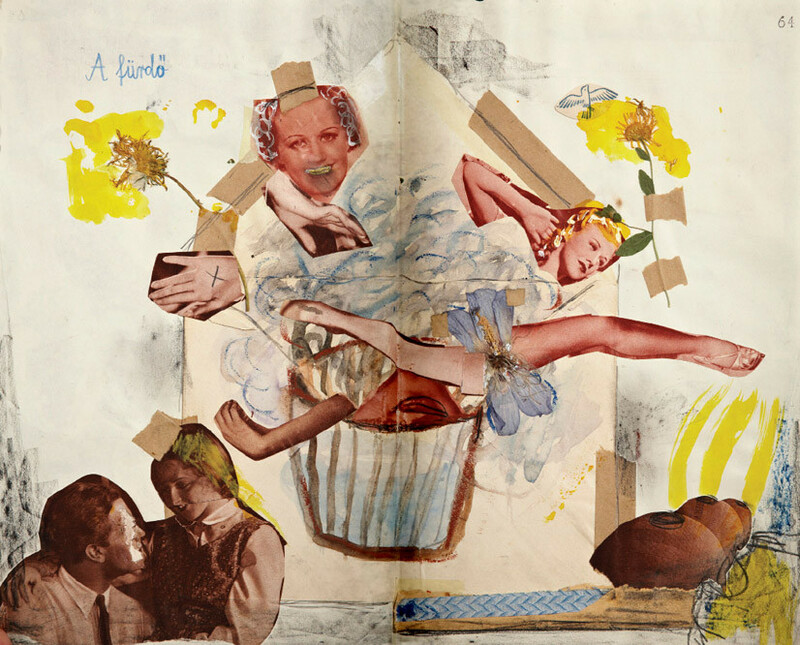 Géza Szöllősi's requirement was to return to the analog technique which, unlike the digital pieces, embodies the will to collect, produce collages and create art from brought and used materials. 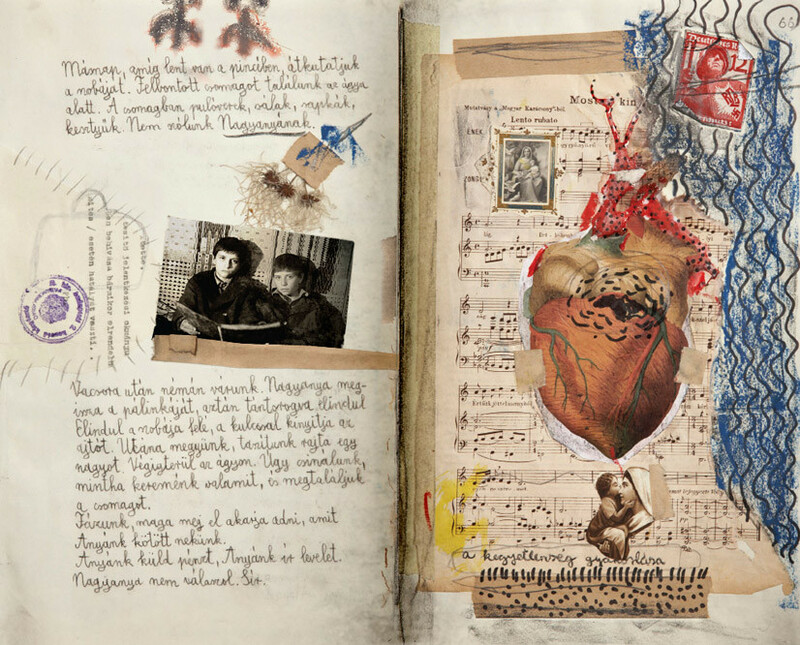 The notes, old pictures, used newspapers are all the heritage of the grandparents. 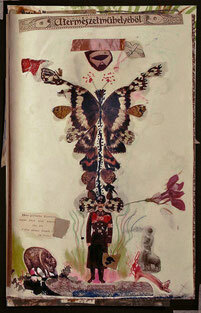 They carry matchless magic. 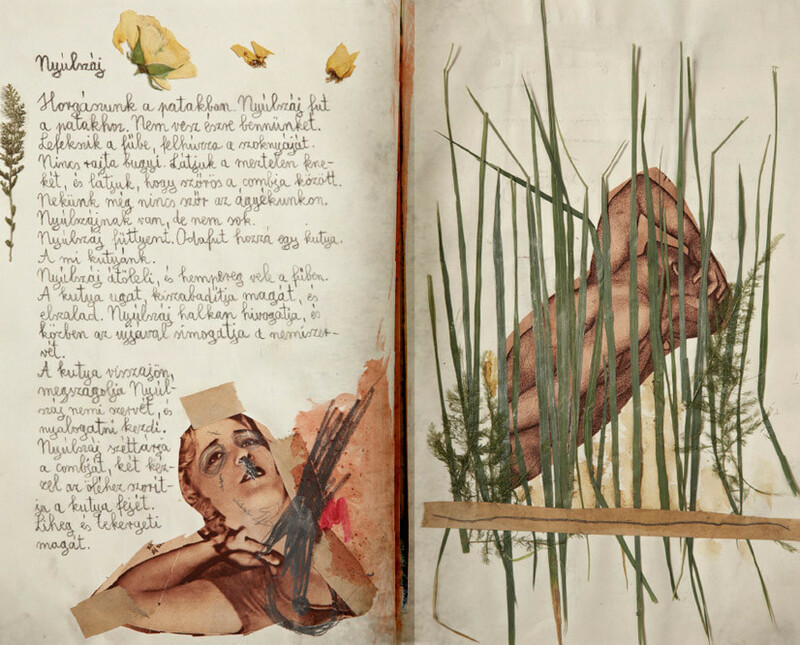 The stale paper, the images deriving from the beginning of the century, the newspapers which are utterly used and the hand written postcards which are exiled to the attic all have their distinct aura:Géza's diary is his memoir and a summary of an era at the same time. 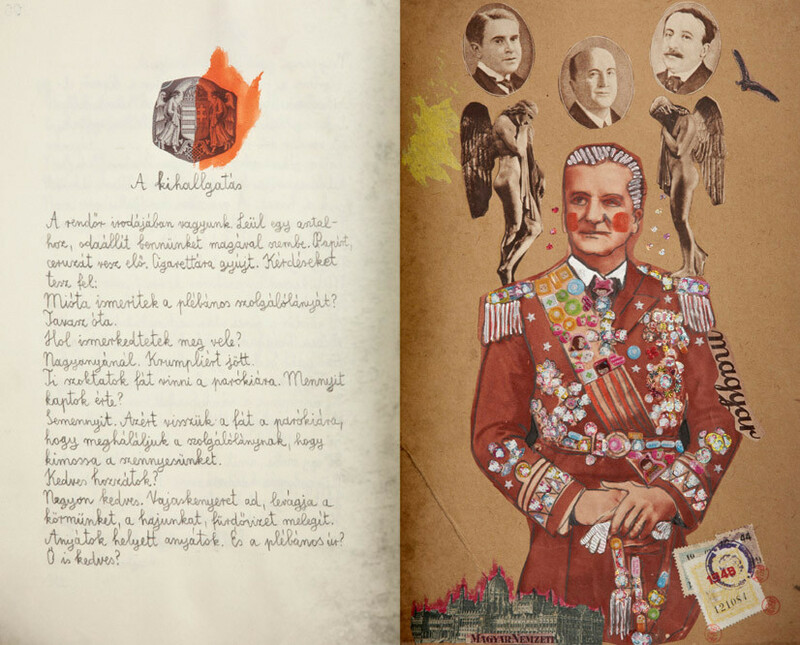 The storyline of The big notebook occupied János Szász, director of the Woyzeck, Witman Boys and Opium, for a long time as well whose intent was not to shoot a film of the novel, but tried to articulate the experiences of the novel stirred up by the authoress in the form of a film. 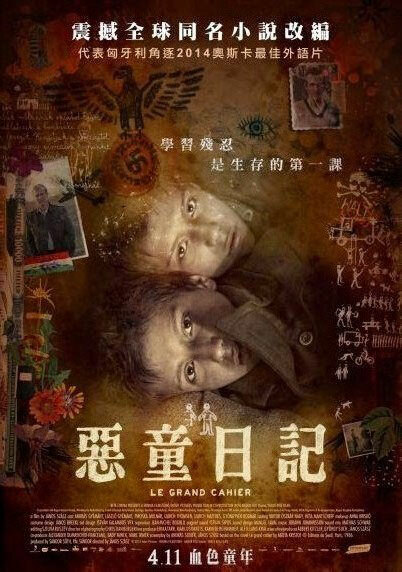 The results are outstanding as the Karlovy Vary International Film Festival, which is the oldest and the sole 'A' category film festival in Central Europe, awarded this piece with the grand prize, the Crystal Globe.